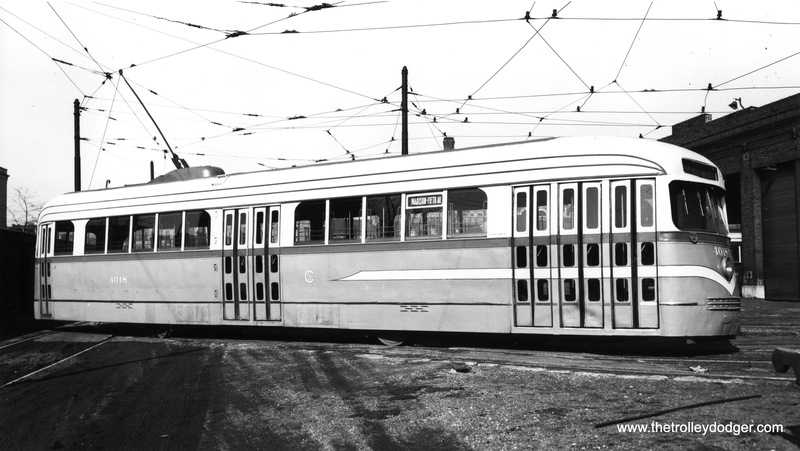 A great collection of photographs to start the year off properly, thanks! 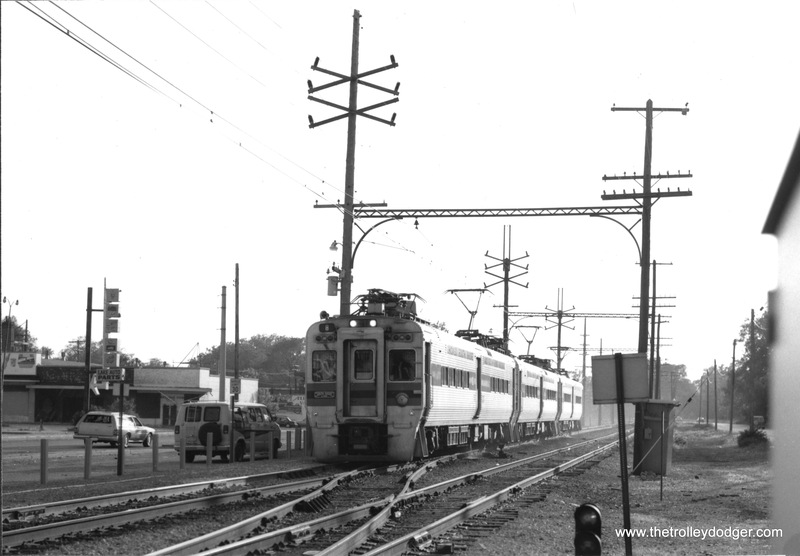 Either there was trackwork going on the Loop L the night the picture was taken, or the Ravenswood train is on the wrong track…or someone got a rarity…a 6000 on Lake. 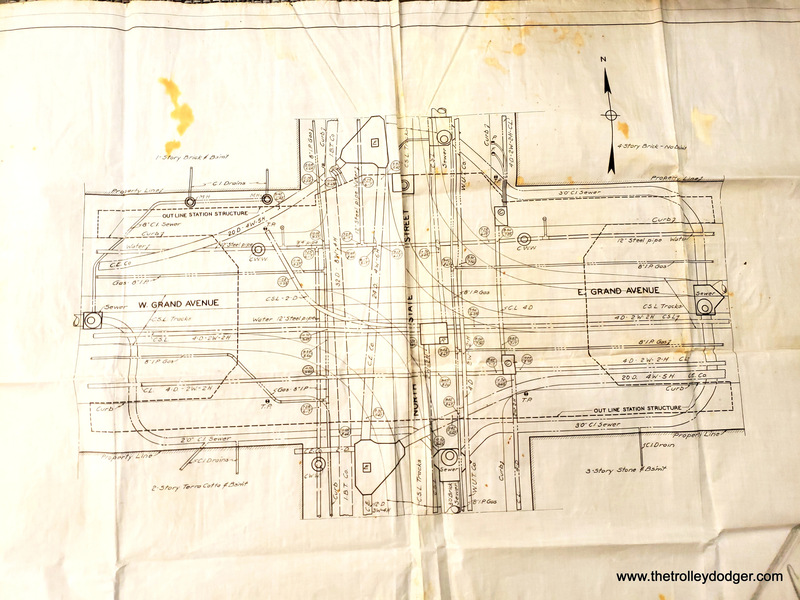 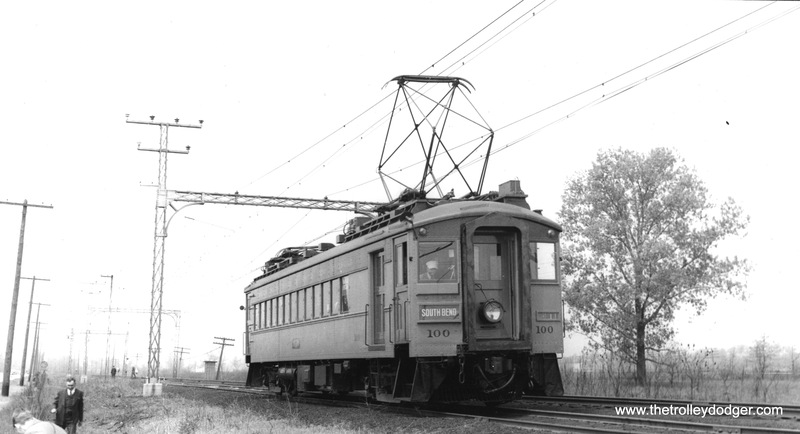 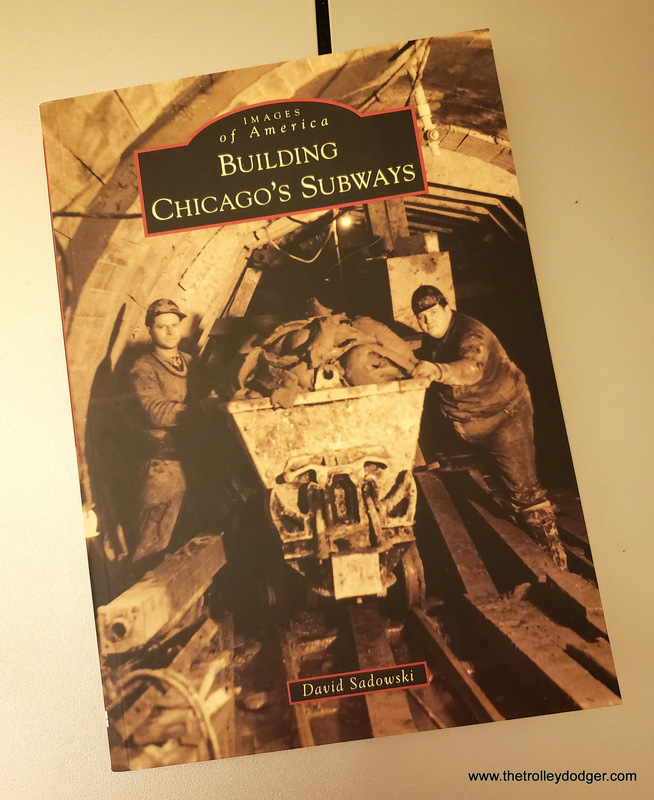 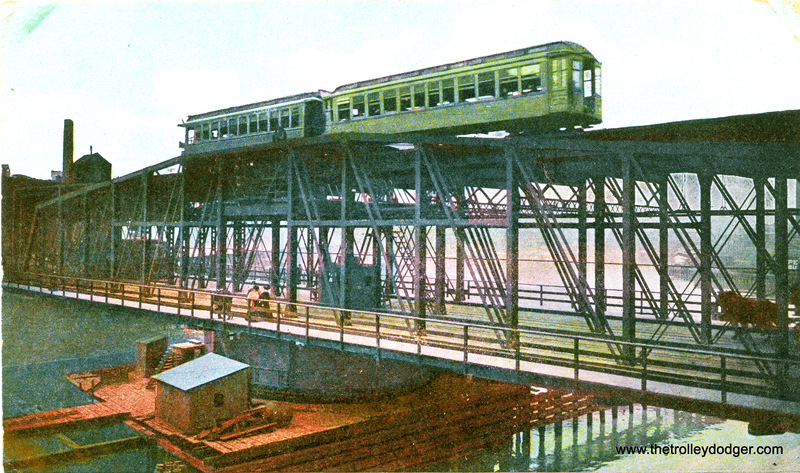 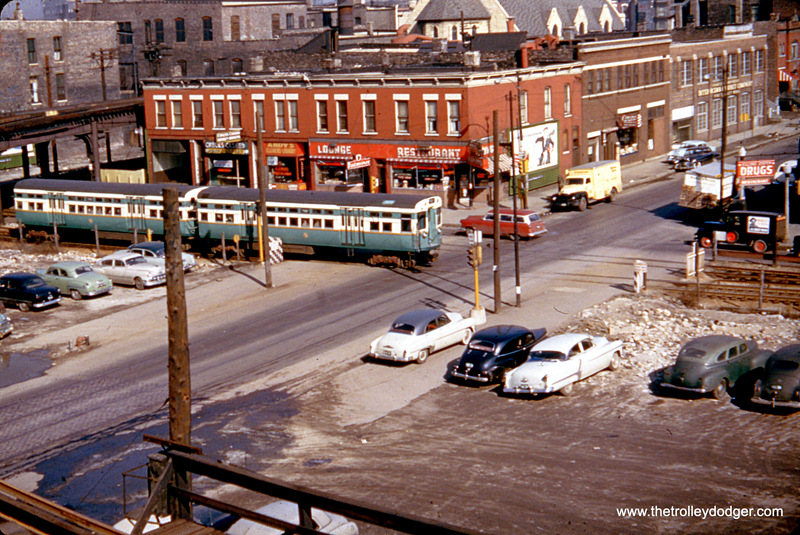 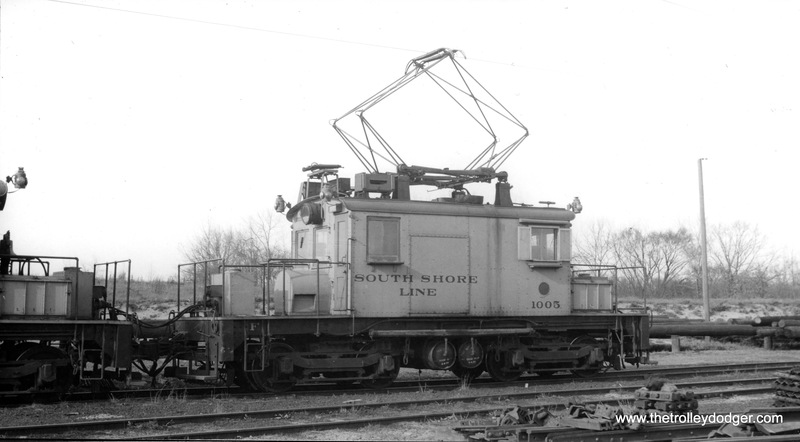 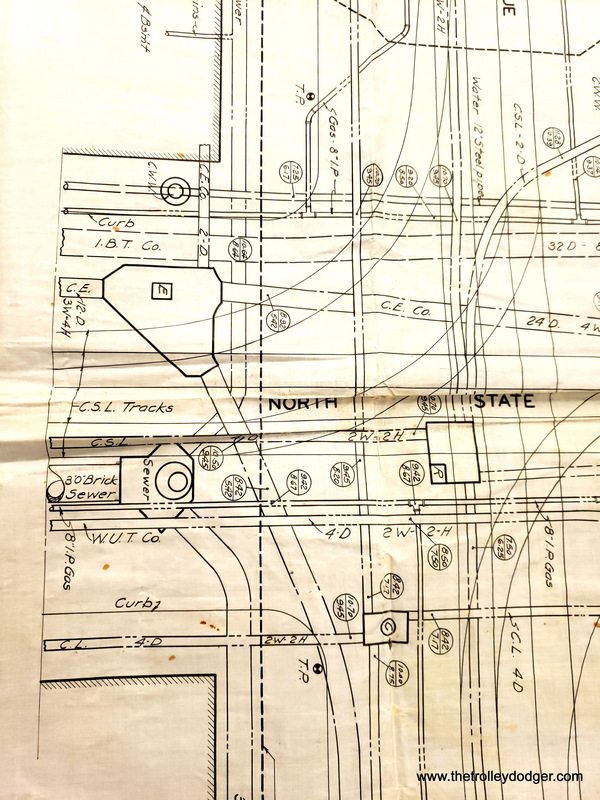 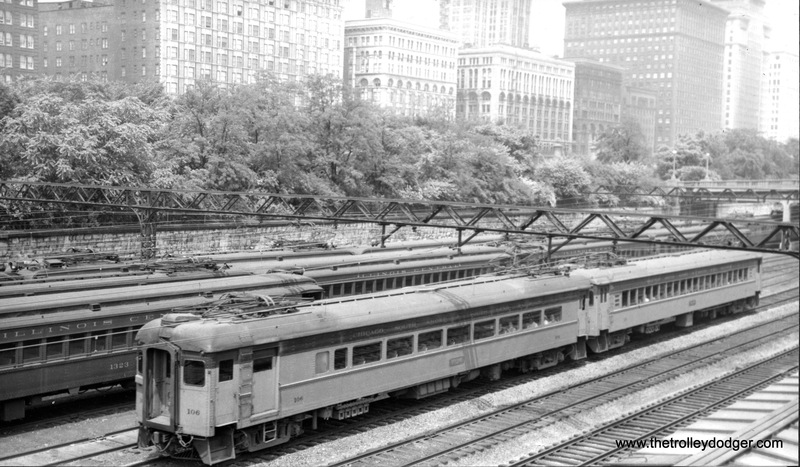 IIRC, back then, Lake Street trains ran on the inner track of the Loop, and Ravenswood and Evanston trains(and possible detours of North-South trains “over the top”) ran on the outer track. 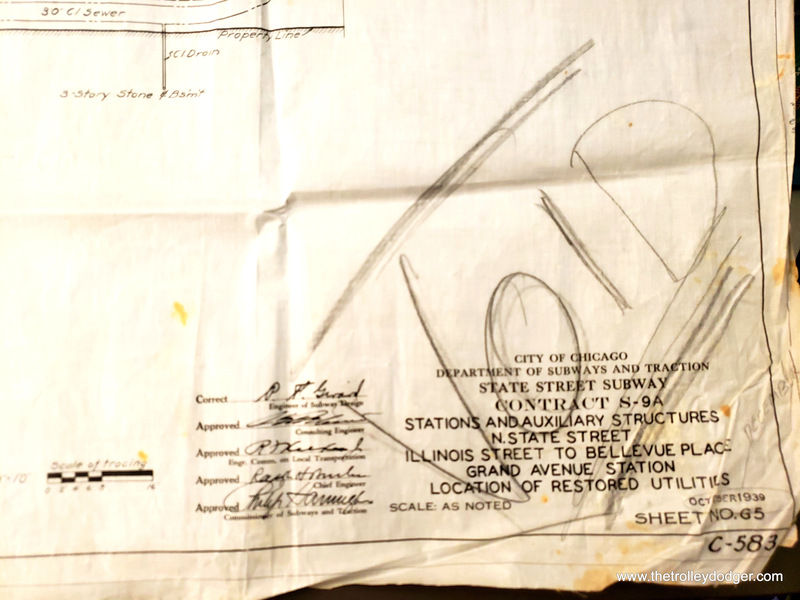 What was up here? 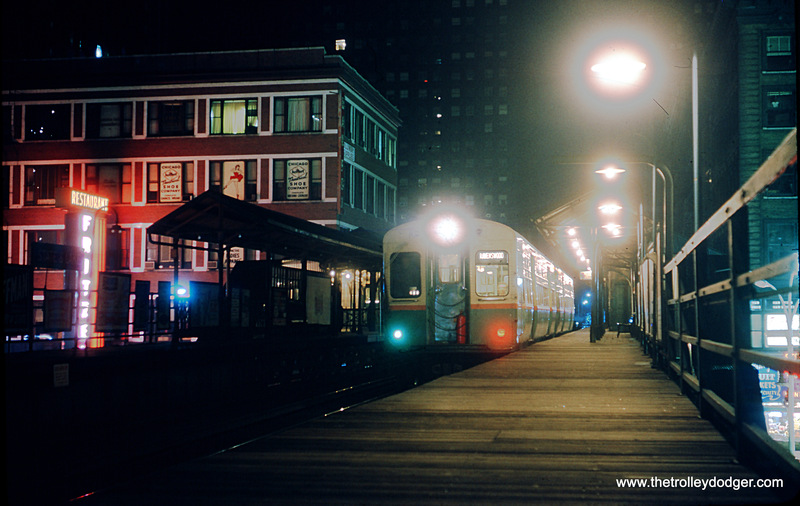 Not only does the sign say Ravenswood, but it has the Rave marker lights. 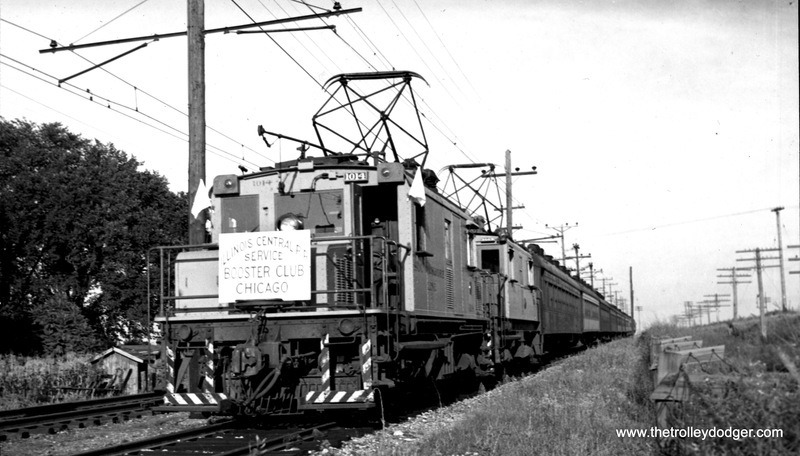 I assume therefore that it’s a Ravenswood train, no matter what track it’s going on. 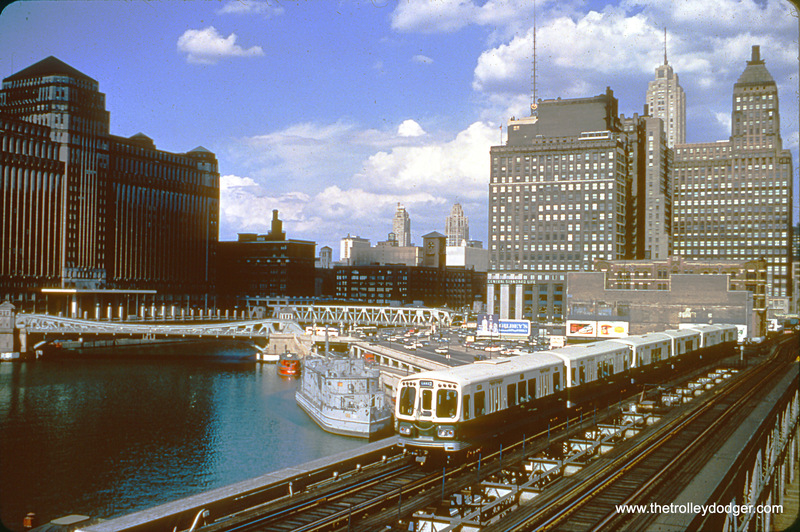 I never saw 6000s on Lake until the Blizzard of ’79. 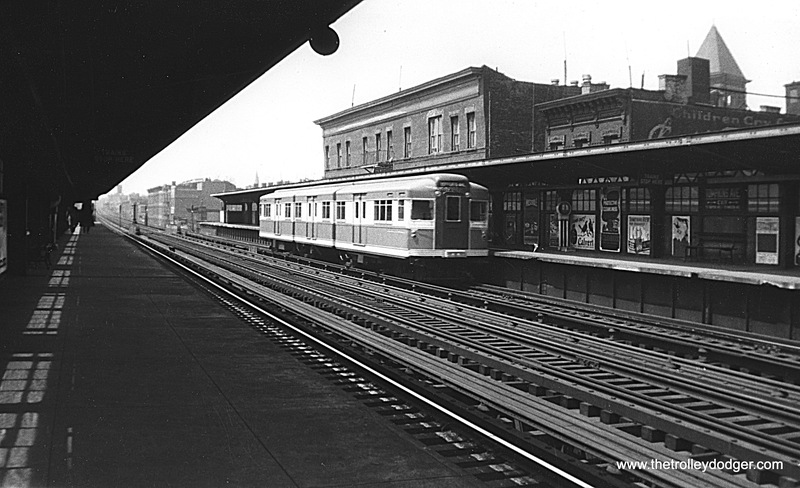 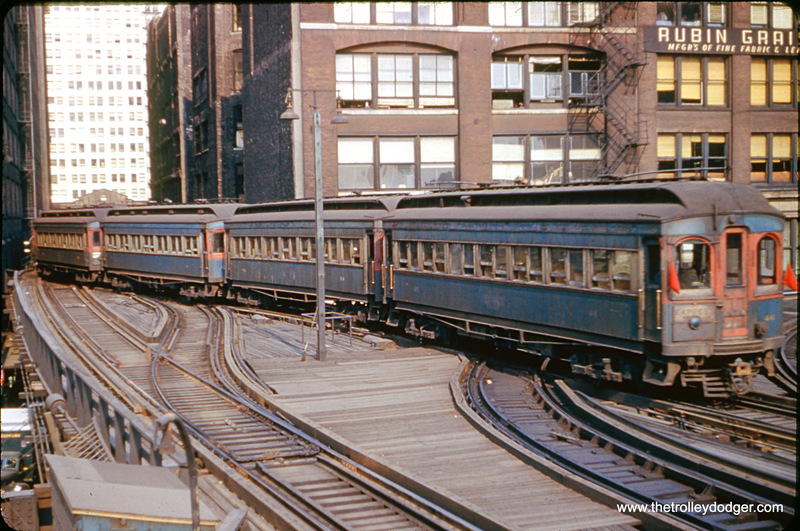 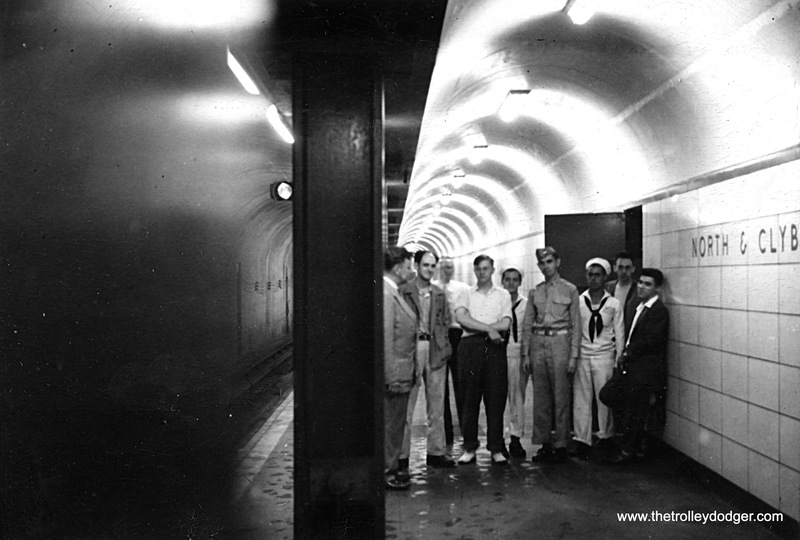 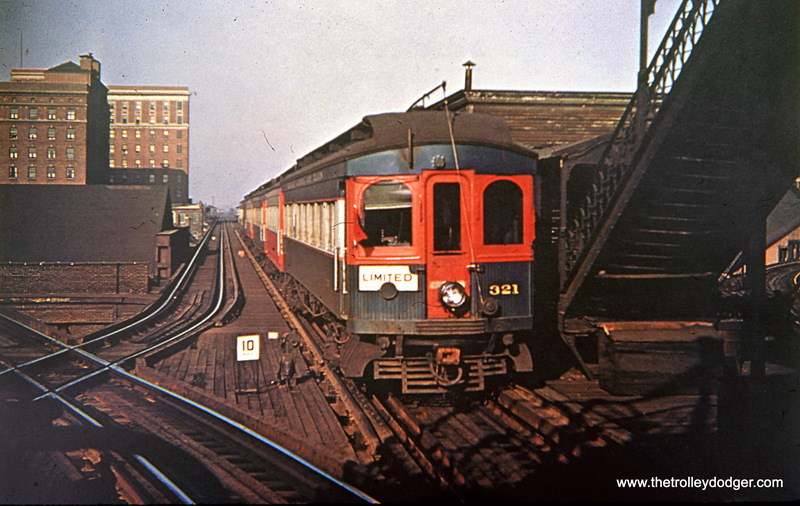 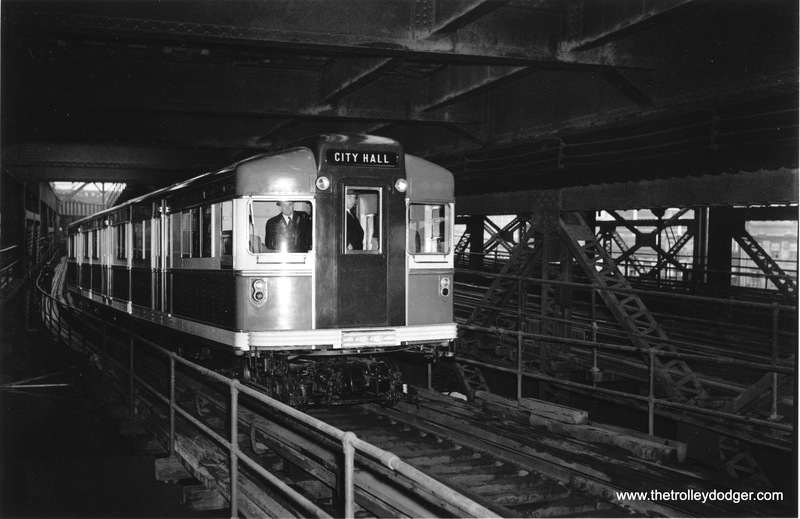 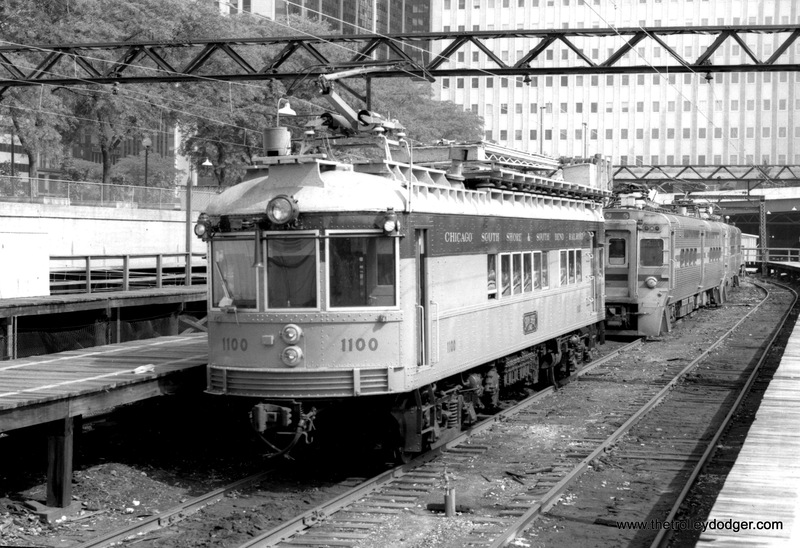 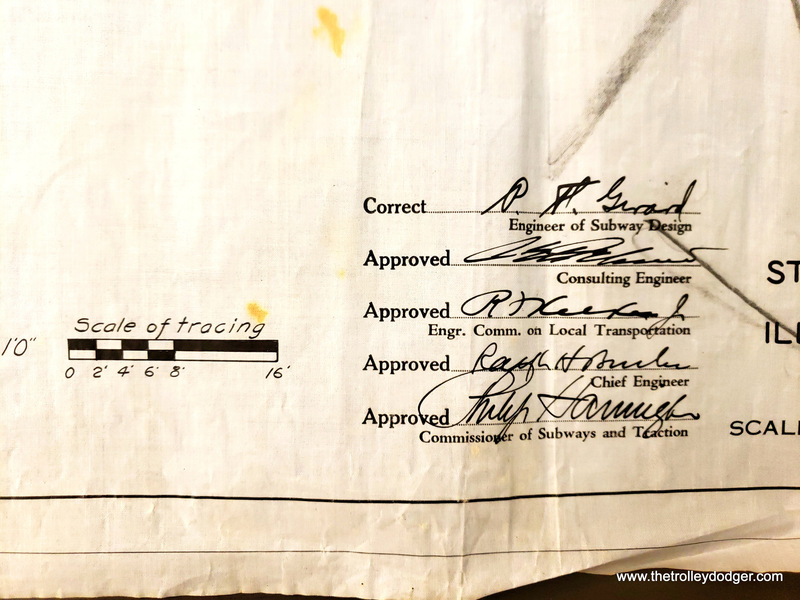 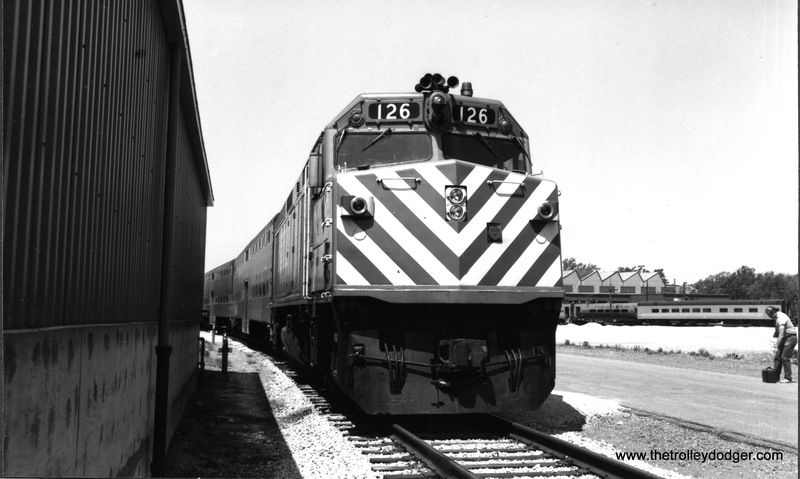 Ravenswood trains switched to the inner track after stopping on the outer track at Randolph& Wells except during weekdays rush hours during the CTA era from sometime in the early to mid 50s until 1969 when the direction of the inner loop track was reversed. 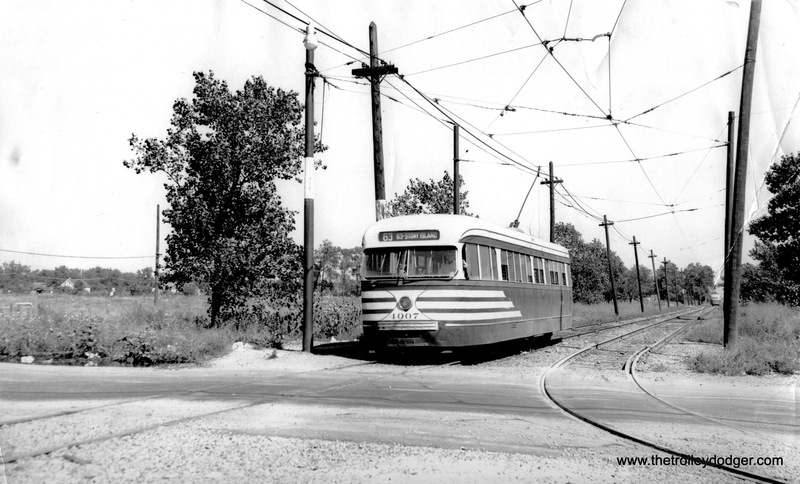 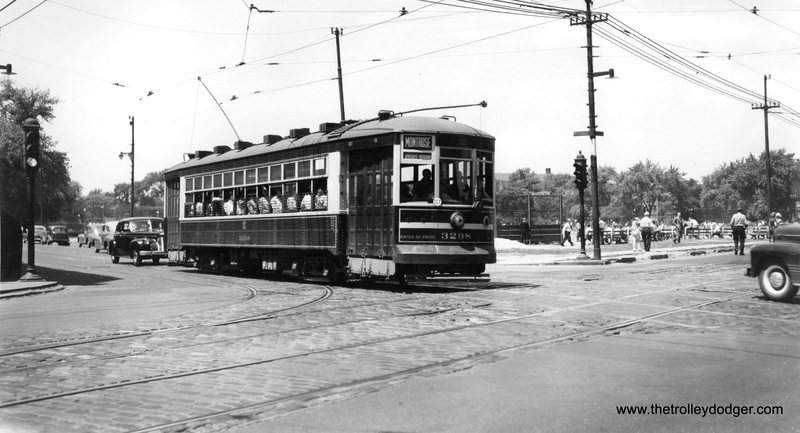 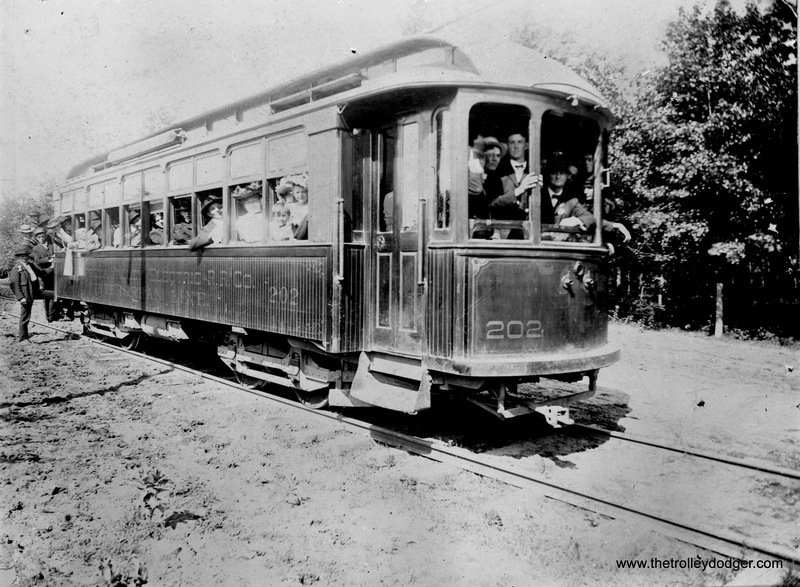 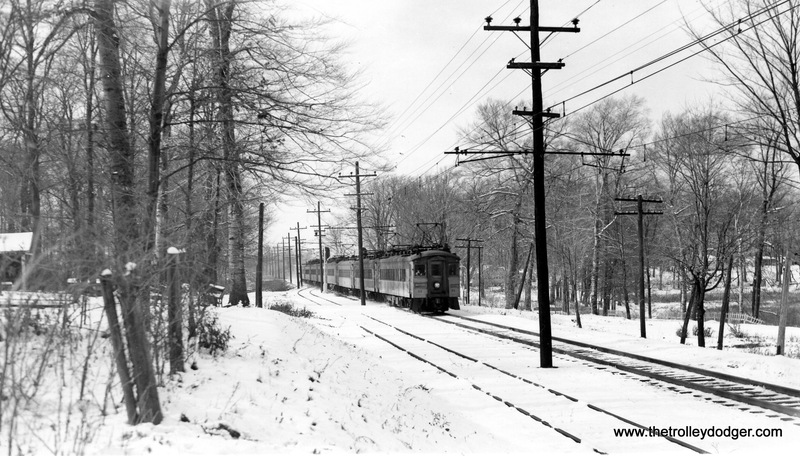 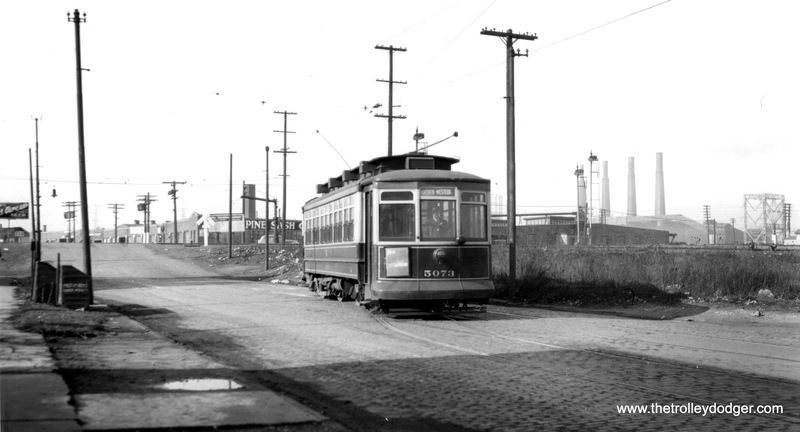 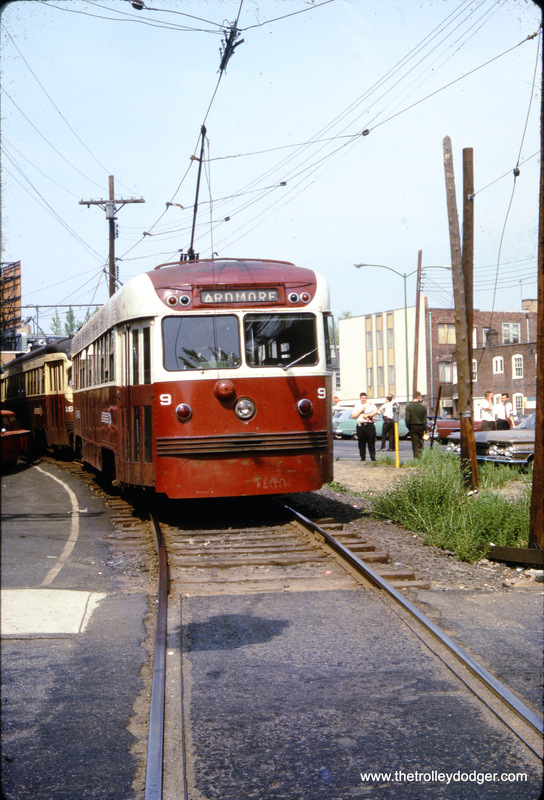 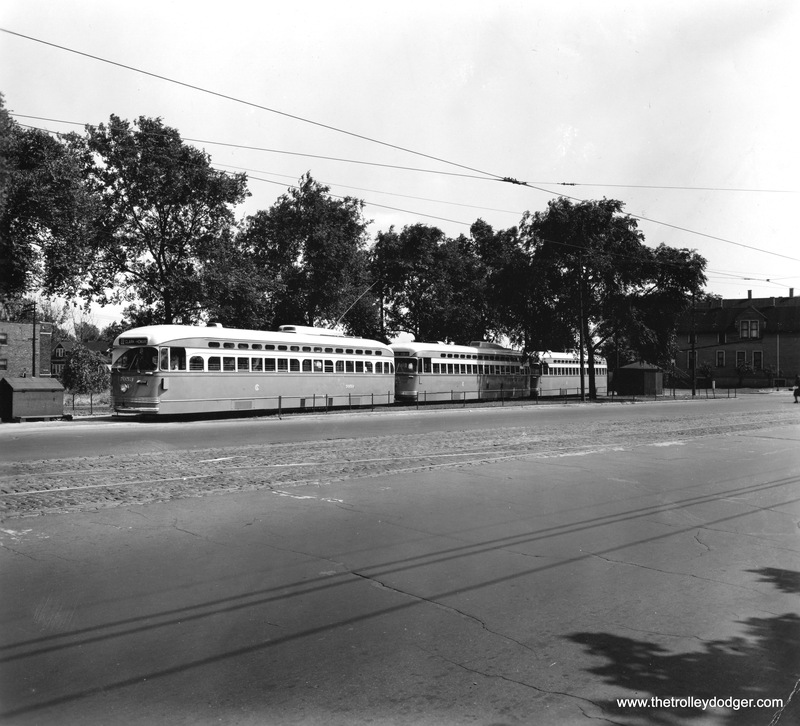 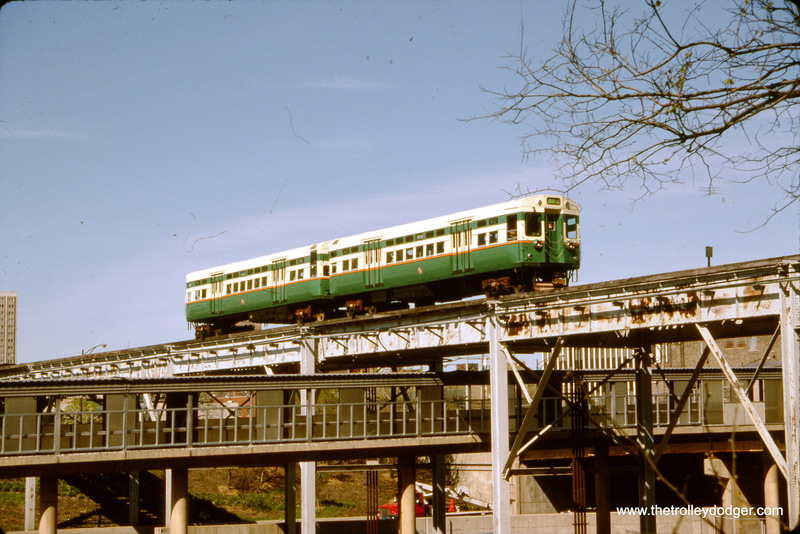 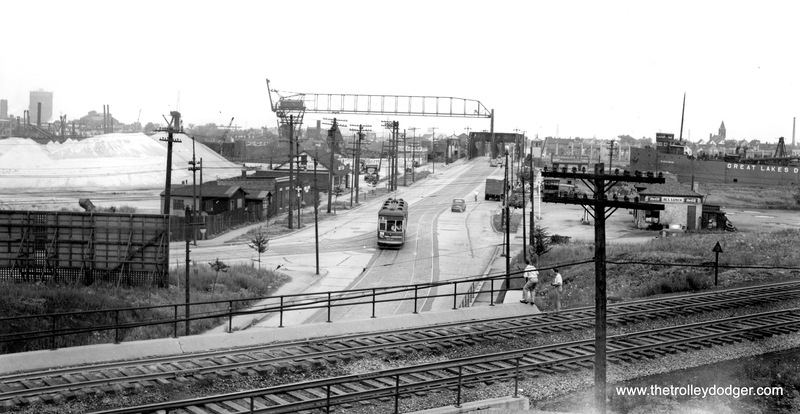 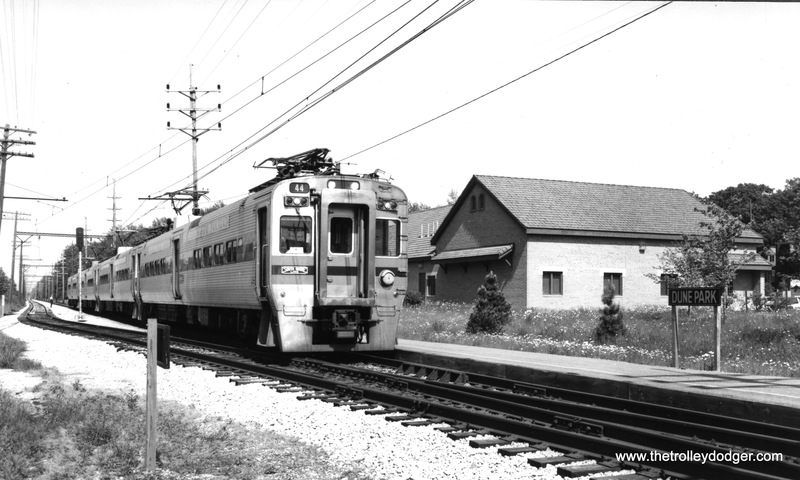 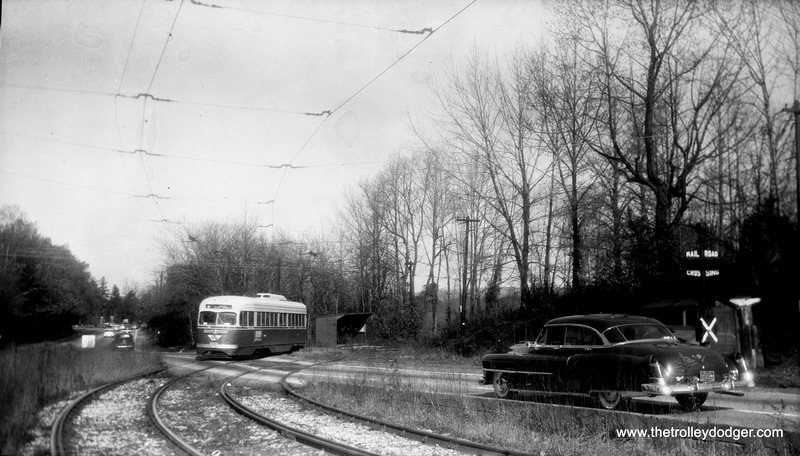 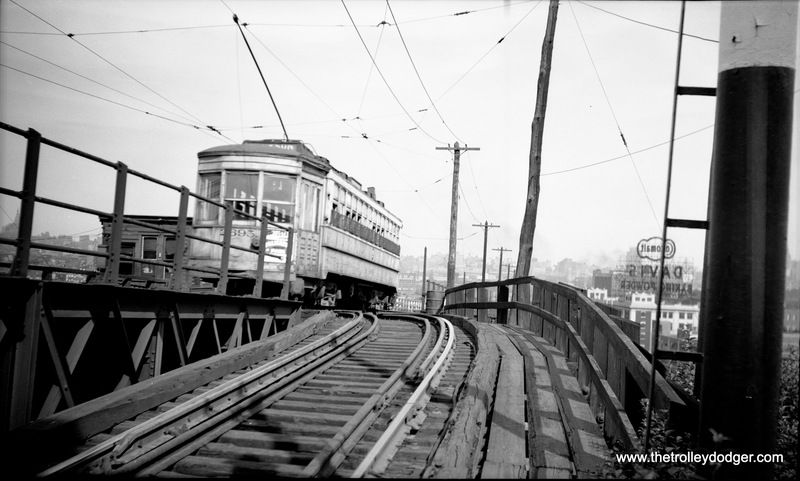 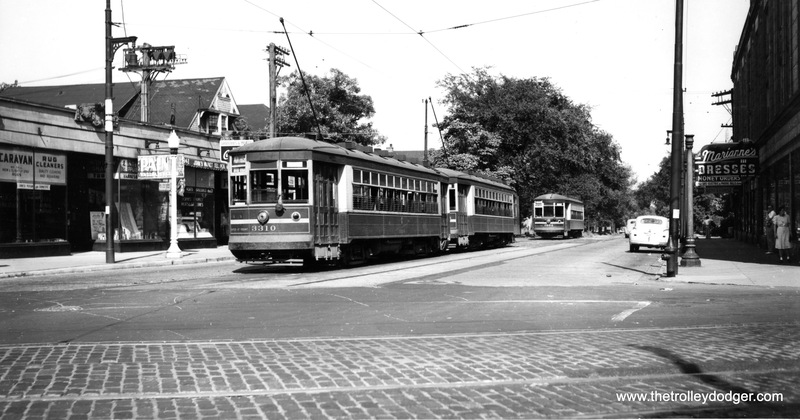 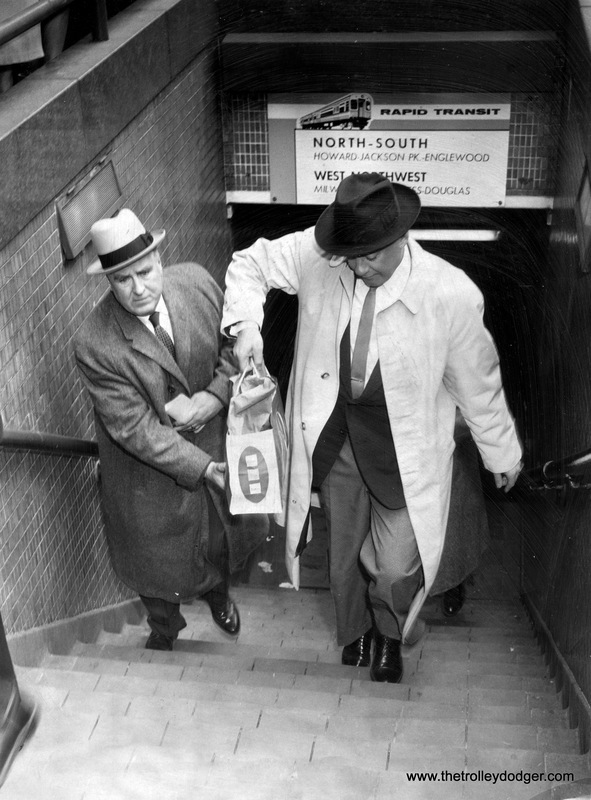 Ravenswood ran on INNER loop except weekday rush hours. 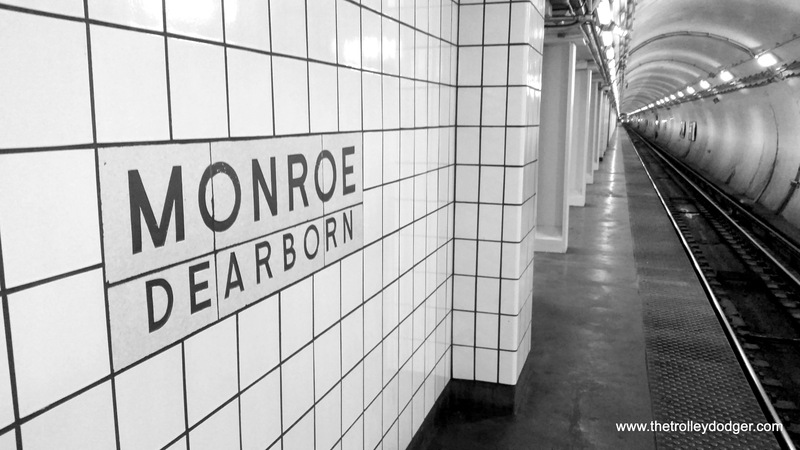 Same for forenoon Evanston Expresses. 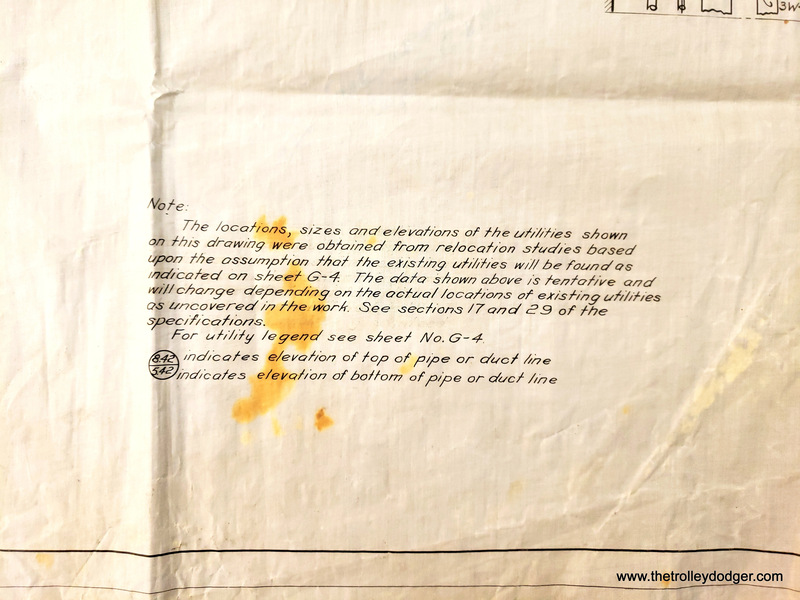 Thanks… that clears things up. 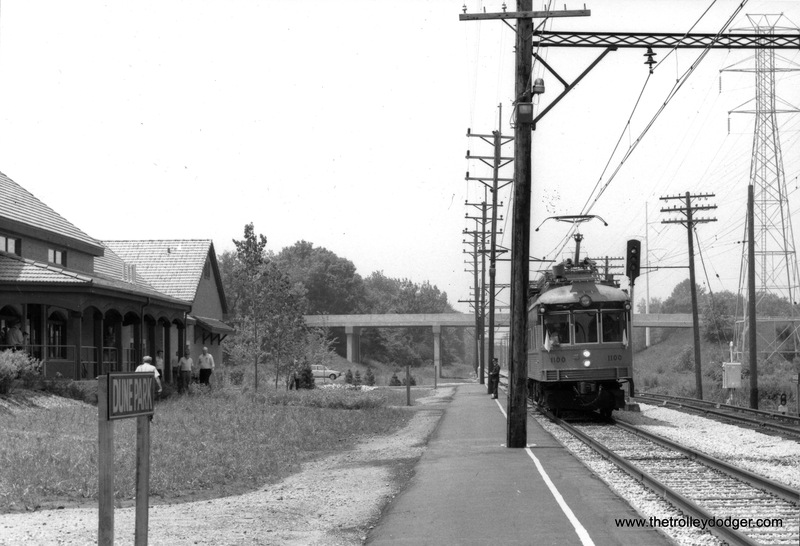 In addition, between Madison/Wells and Clark/Lake non-rush Ravenswood (and Evanston) stopped AFTER the station houses while Lake stopped BEFORE the station houses. 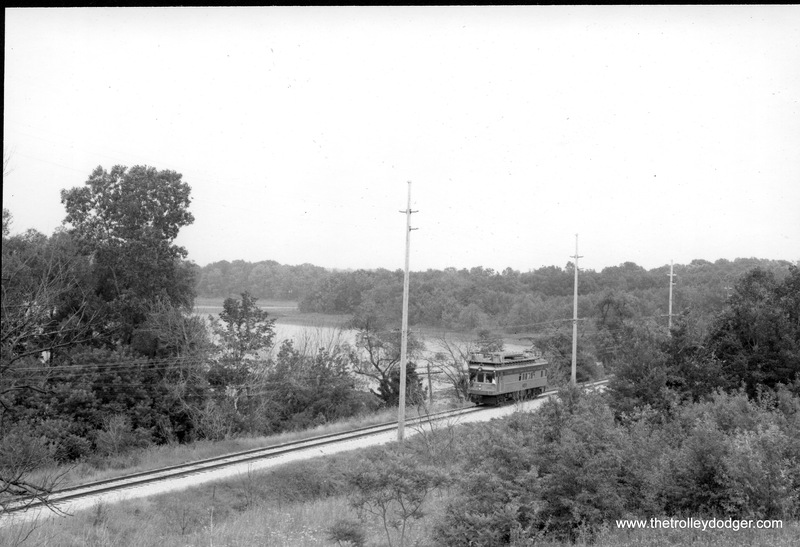 You could tell what was coming as Ravenswoods had 2 headlights (6000) while Lake had 1 (4000). 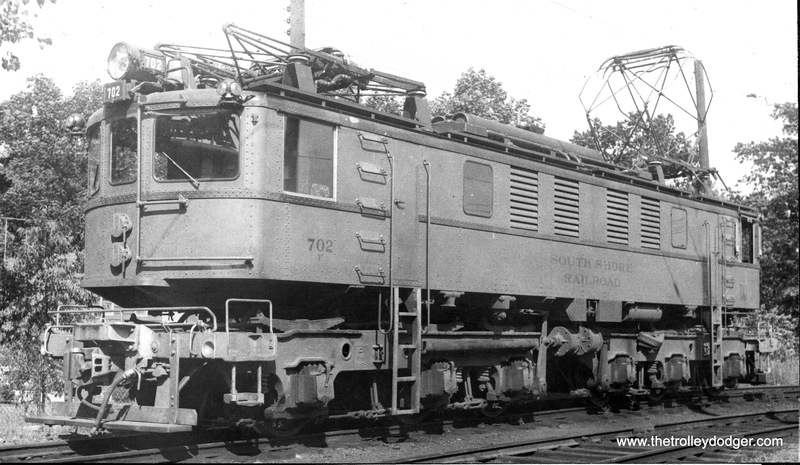 Later this reversed with 2000’s on Lake and 6000’s redone with one headlight! 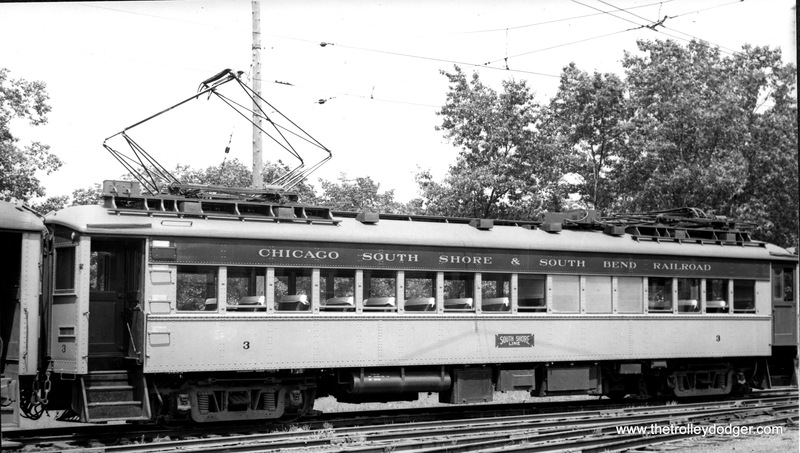 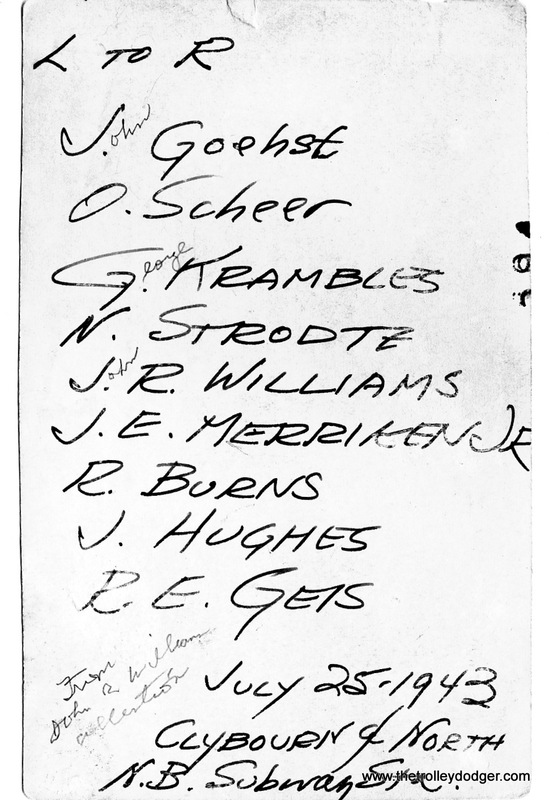 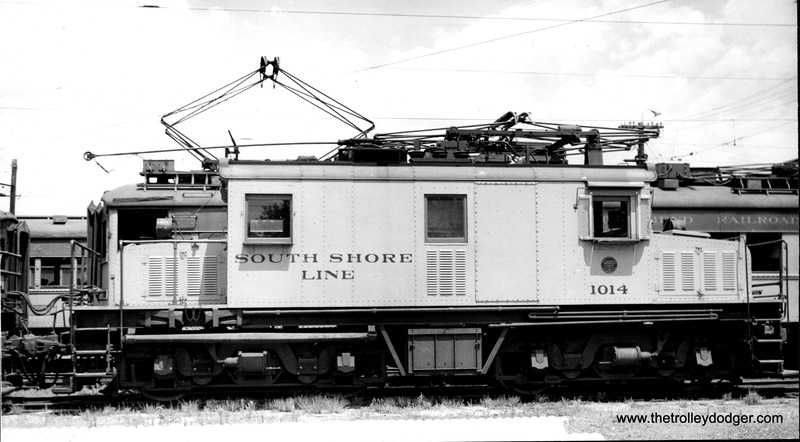 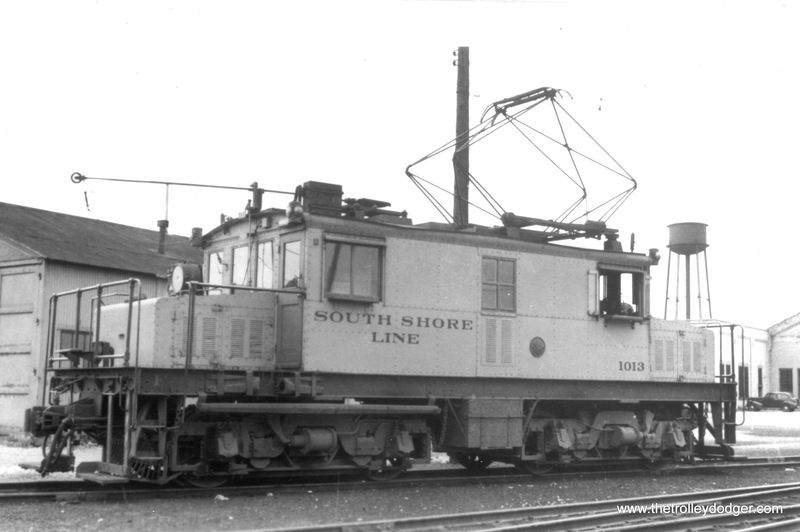 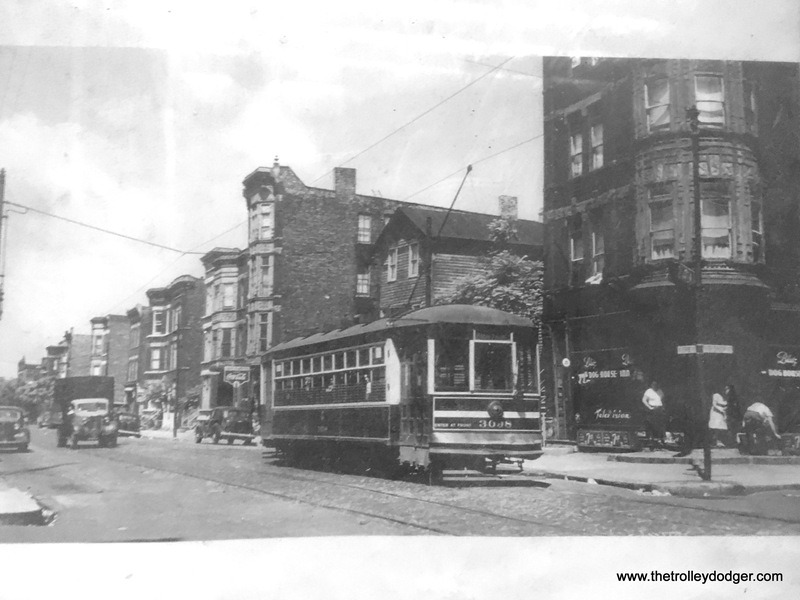 Regarding South Shore parlors and diners, all were out of service circa 1930 or so. 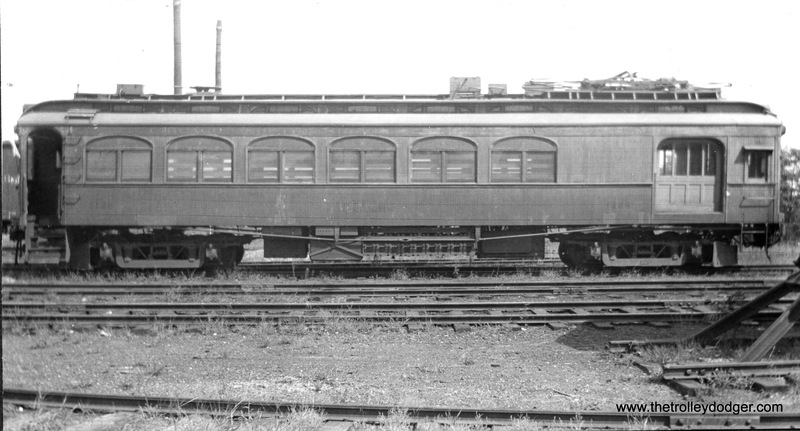 During WW2 all were stripped out and made coaches, but the 6-wheel ones were disposed of right after the war while the 4-wheel pair lasted until the 60’s. 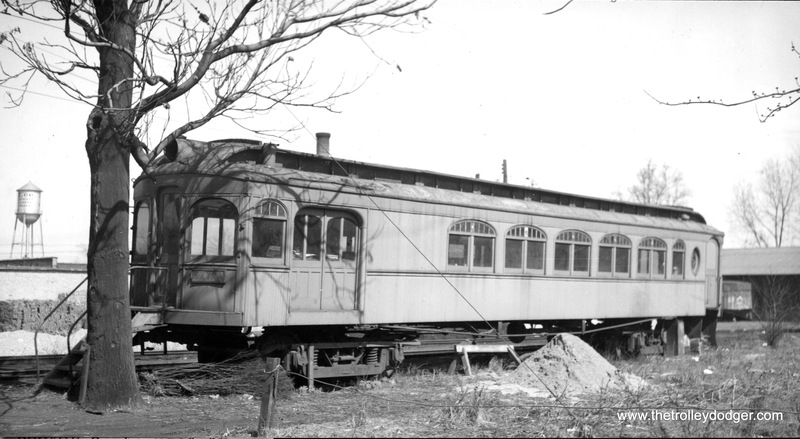 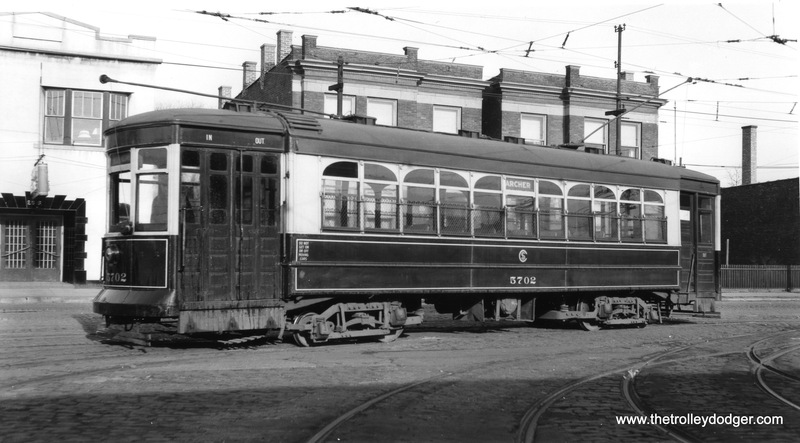 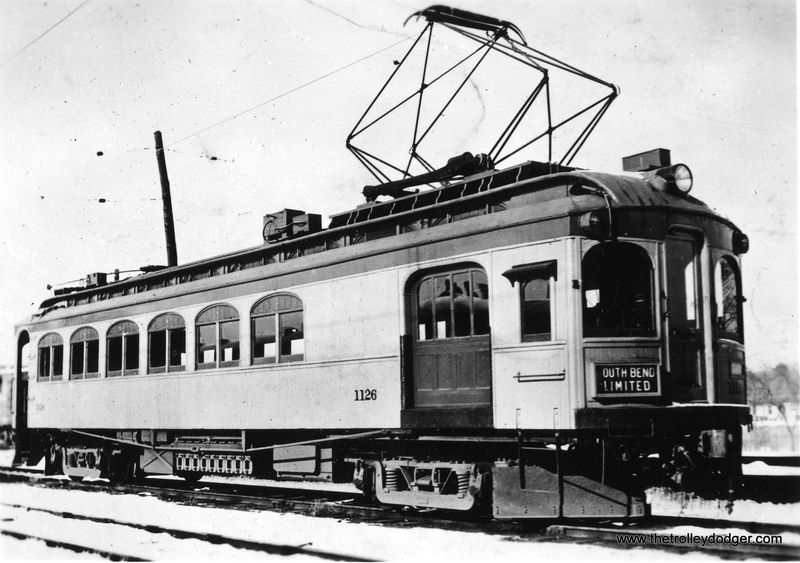 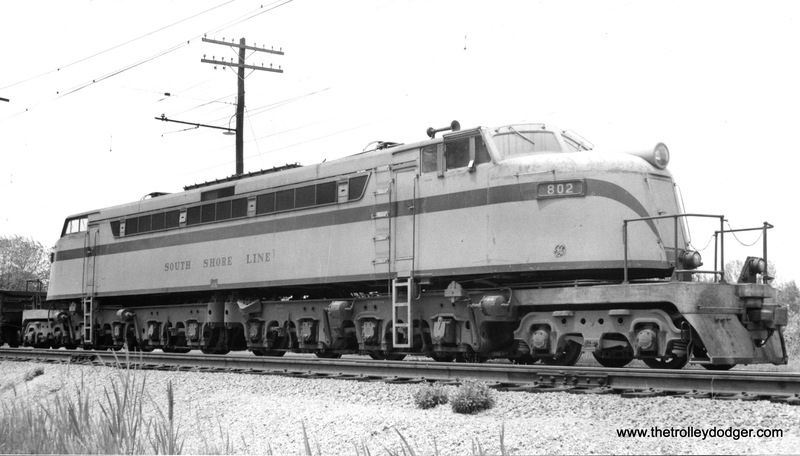 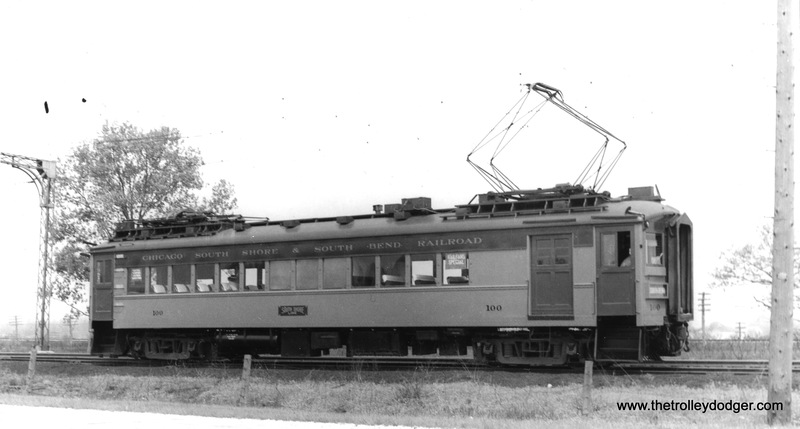 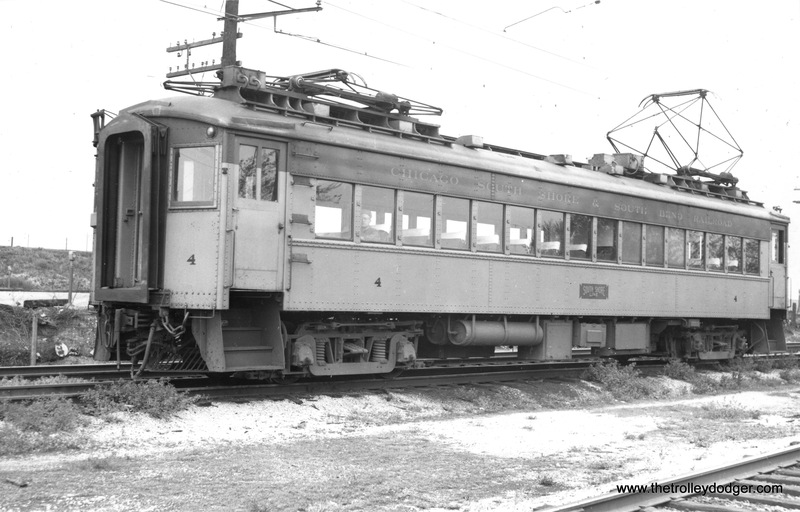 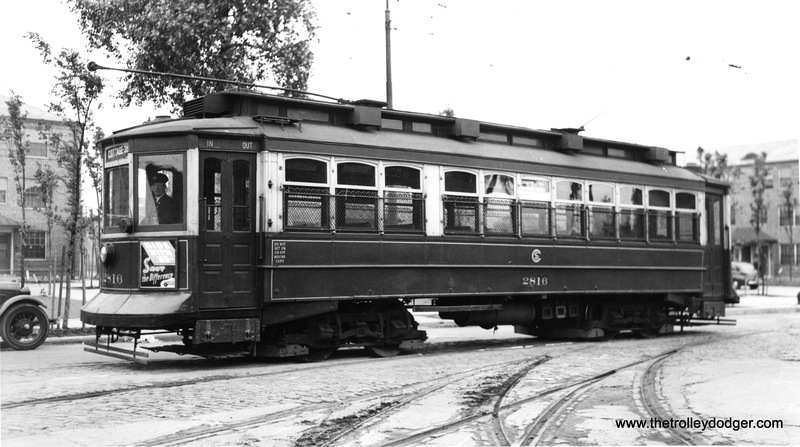 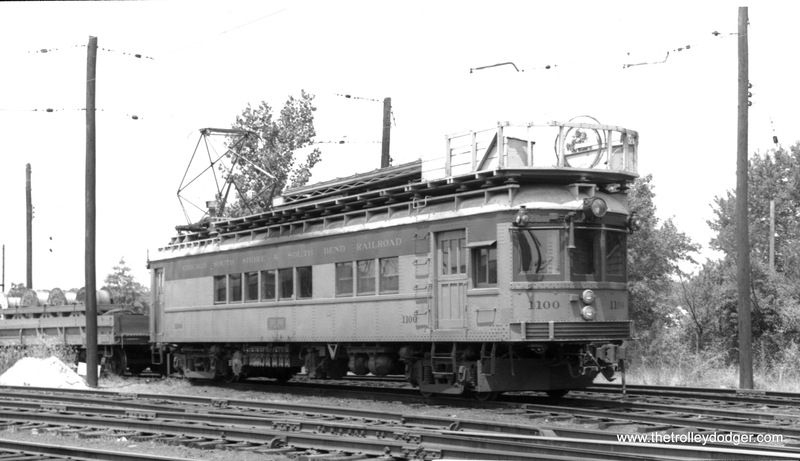 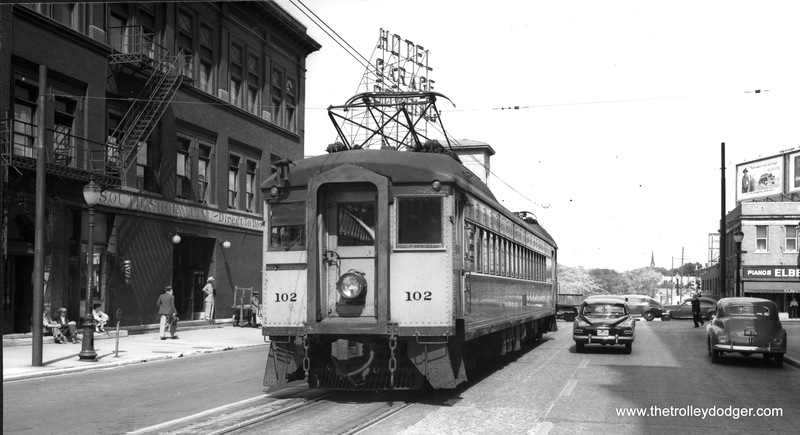 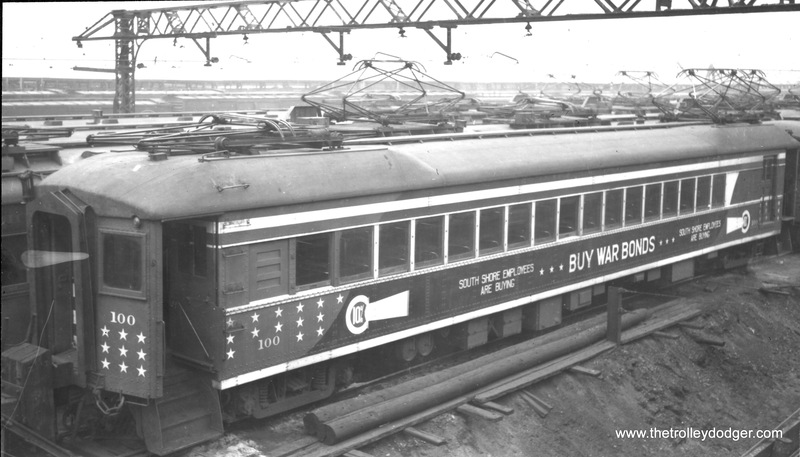 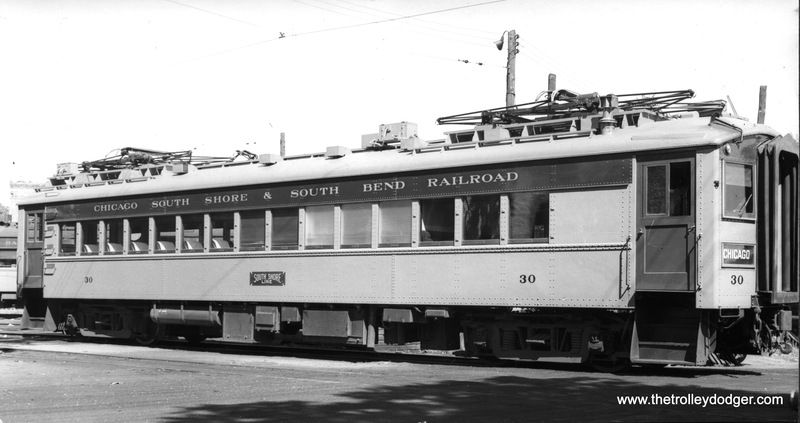 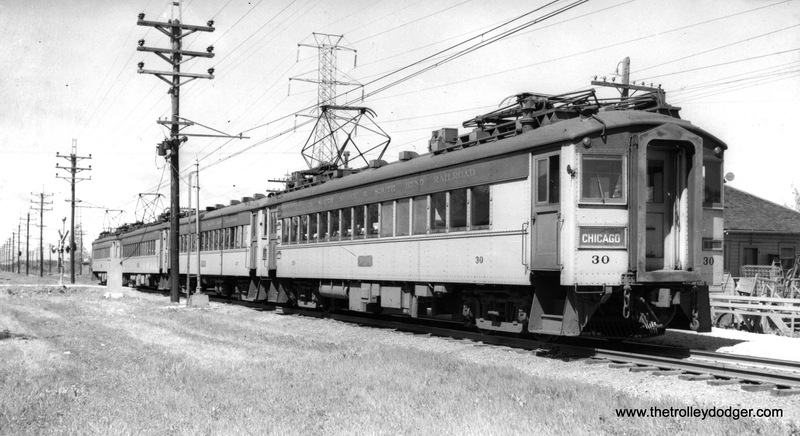 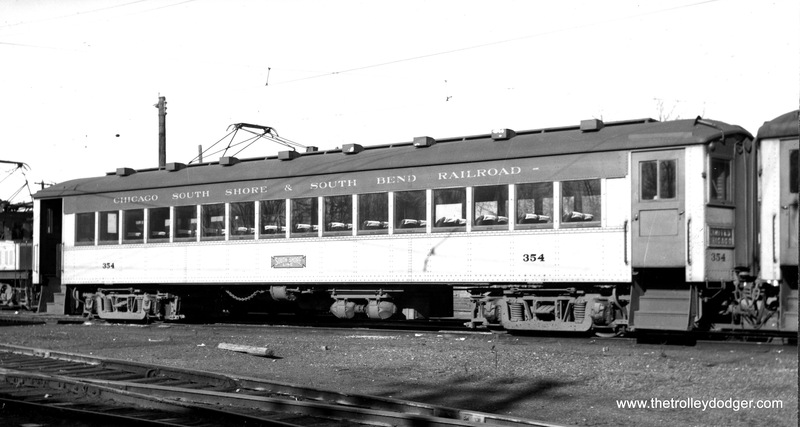 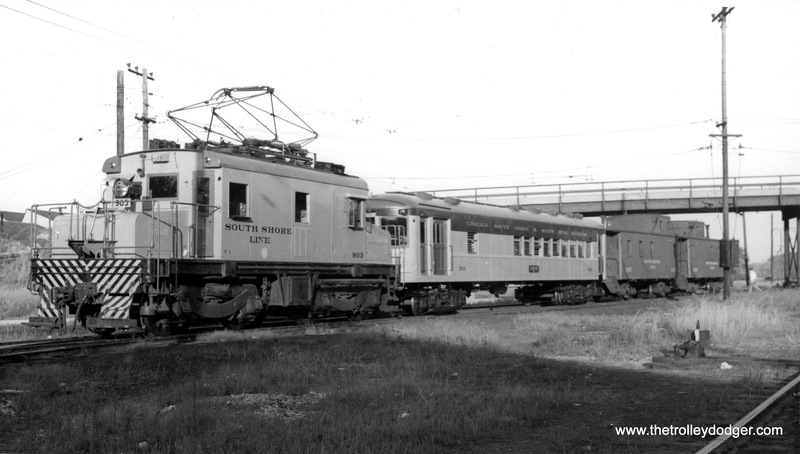 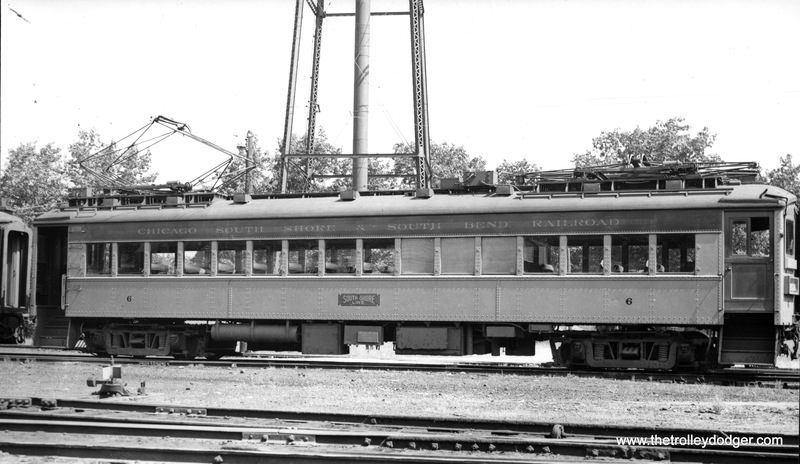 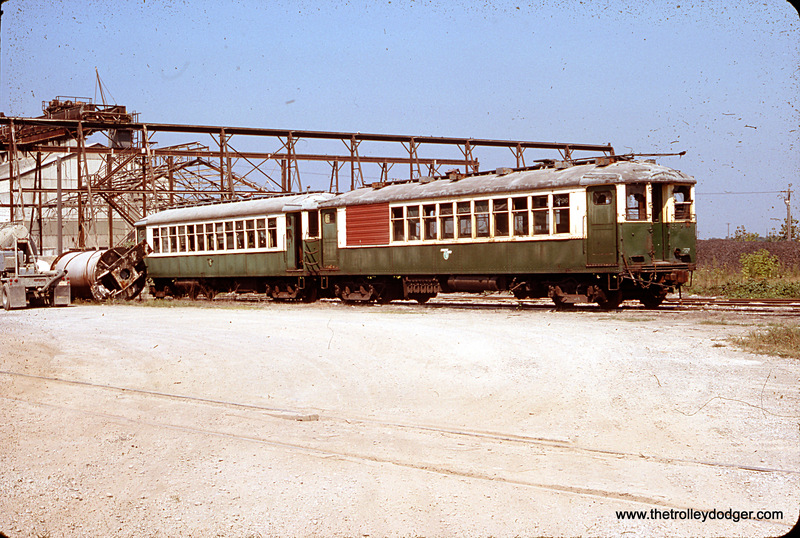 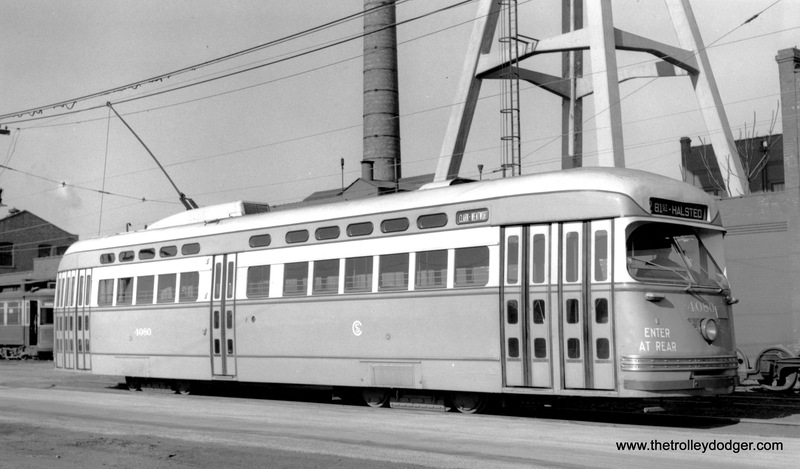 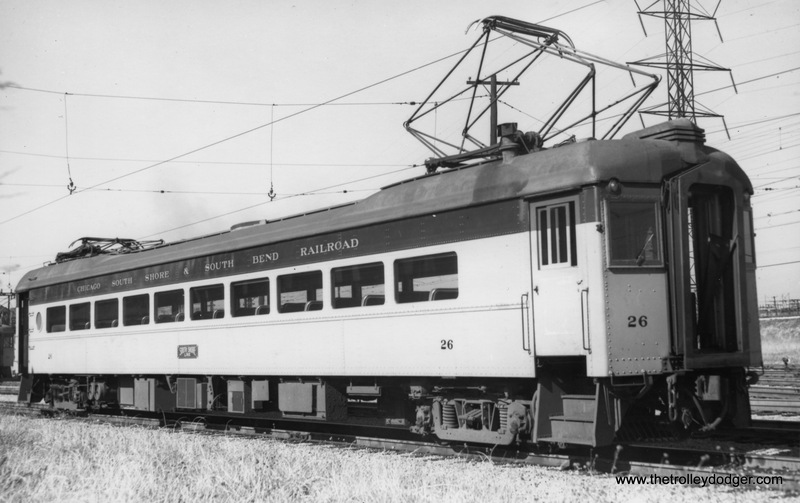 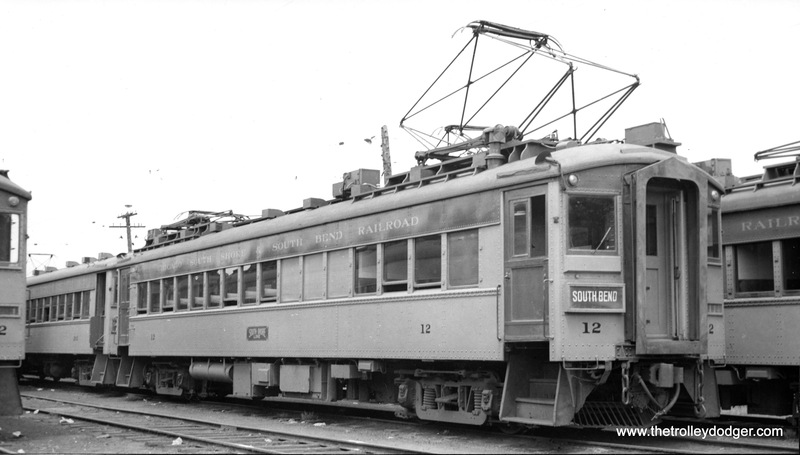 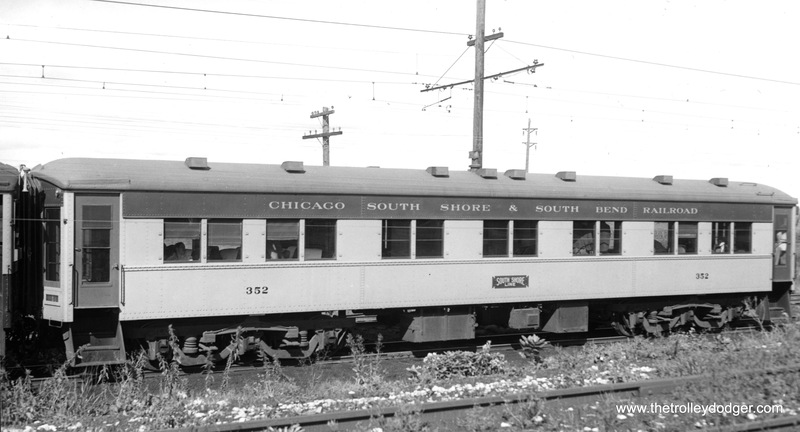 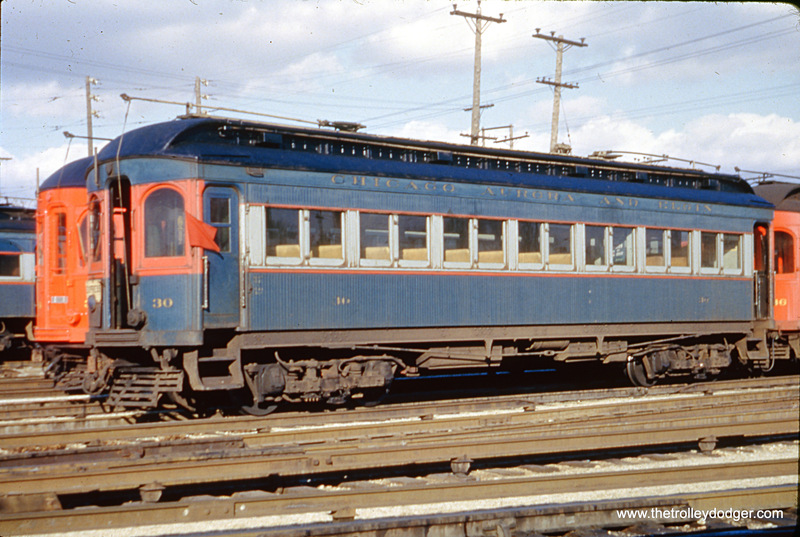 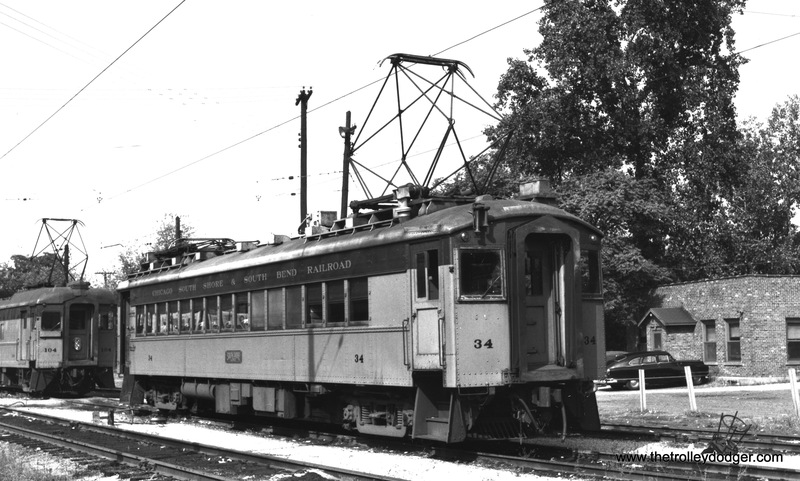 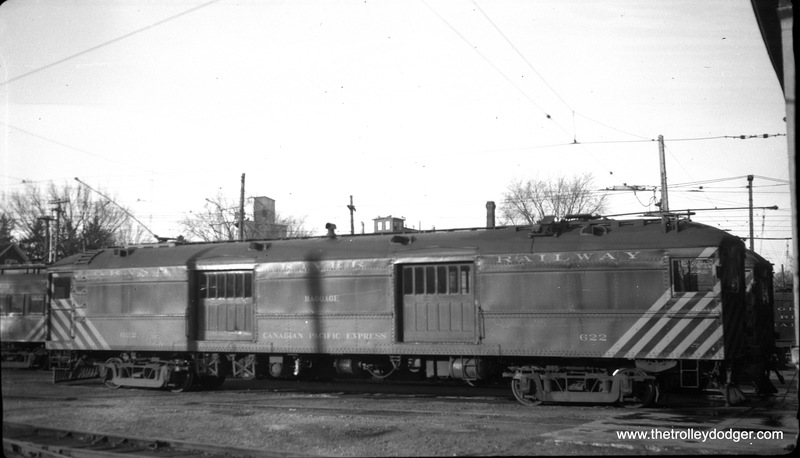 Looks more like CSS&SB Car #34 is in the South Bend Coach yard. 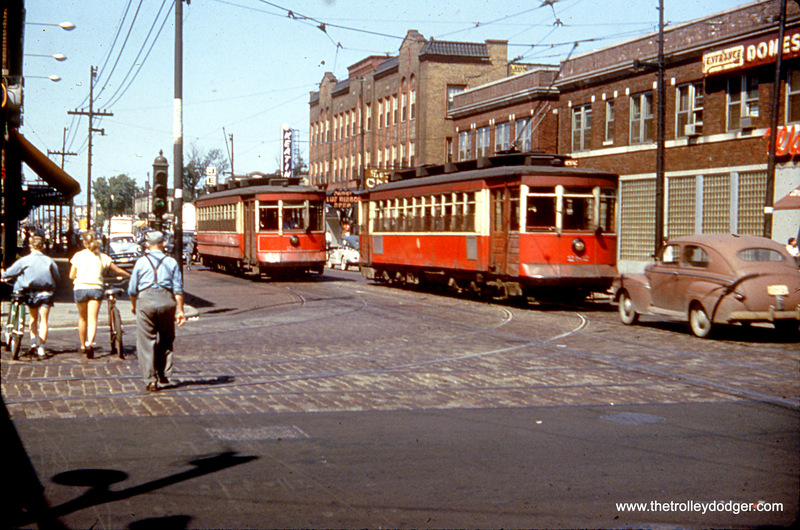 A few comments, Pix #580 is looking west on Montrose from Ashland, the bldg on the right is on the NW corner. 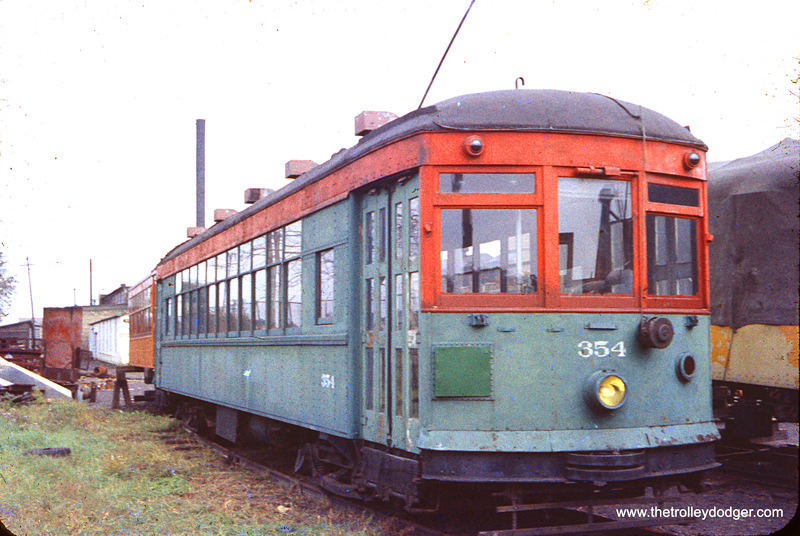 #584, car #3310 is behind the car waiting to go east. 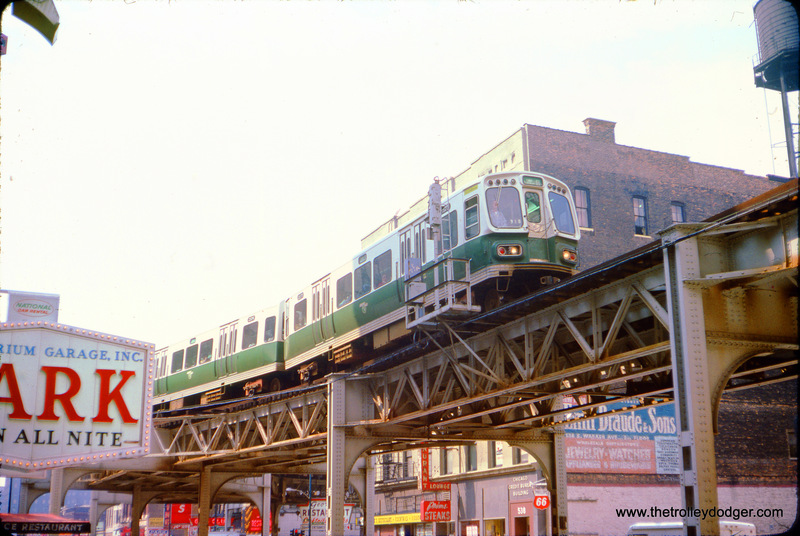 This was always a problem with PM pull-out trippers at the end of line crossovers. 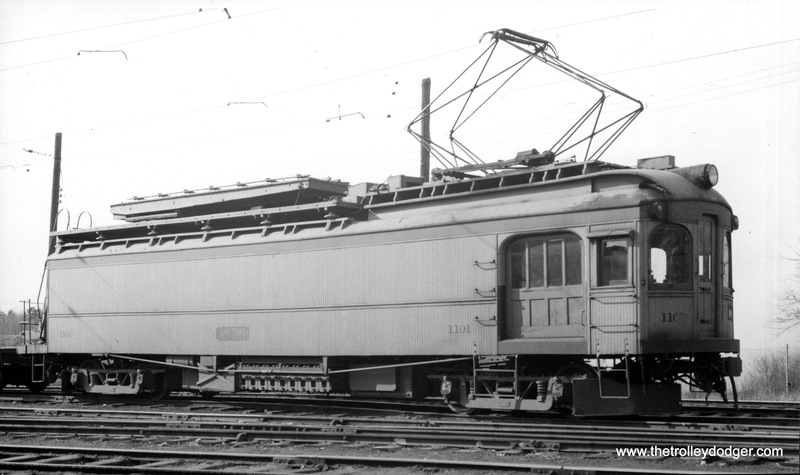 The regular cars would have a longer layover/recovery time than the pull-outs would have. 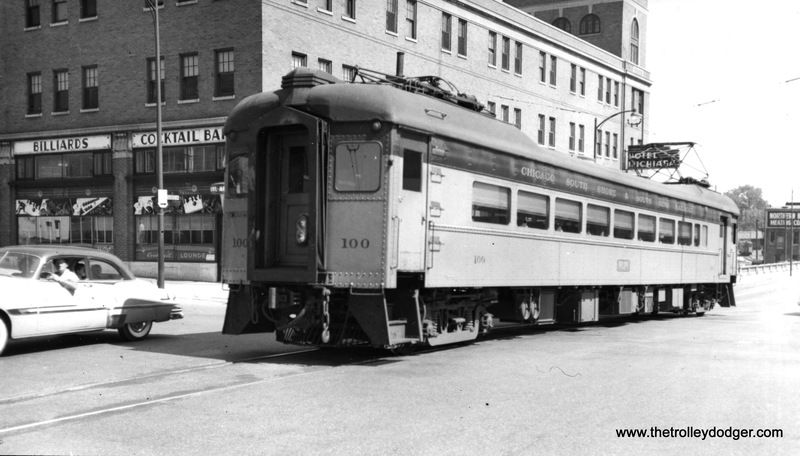 Often the tripper would arrive after their follower, hence the follower at the extreme end with its leader squeezed in so as to leave first. 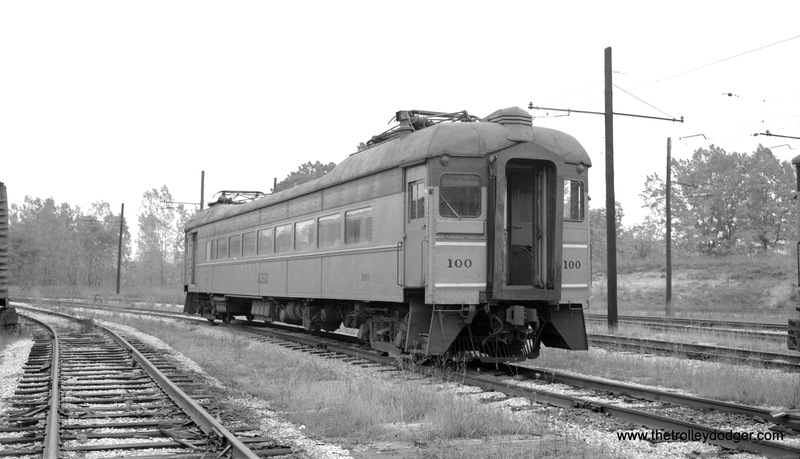 If two followers were there first, one would have to take the crossover & back up on the adjacent track. 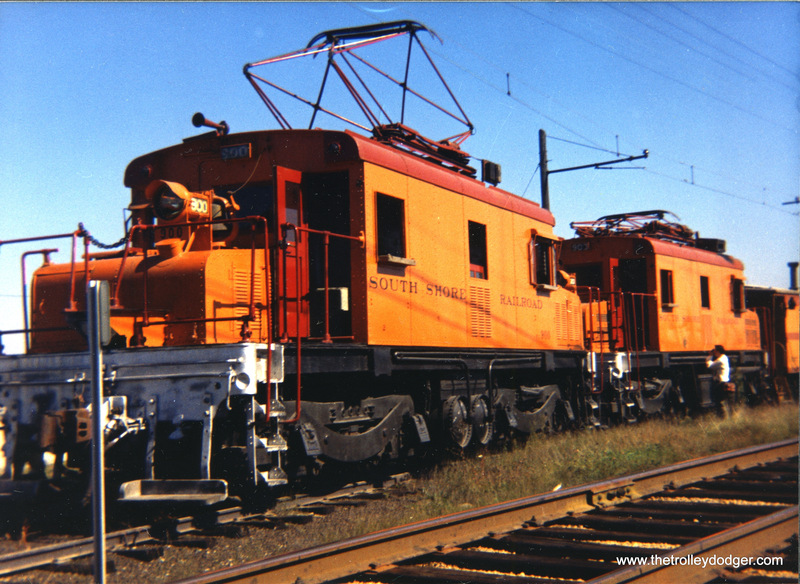 This I learned from observation when I was younger & also from CSL family members. 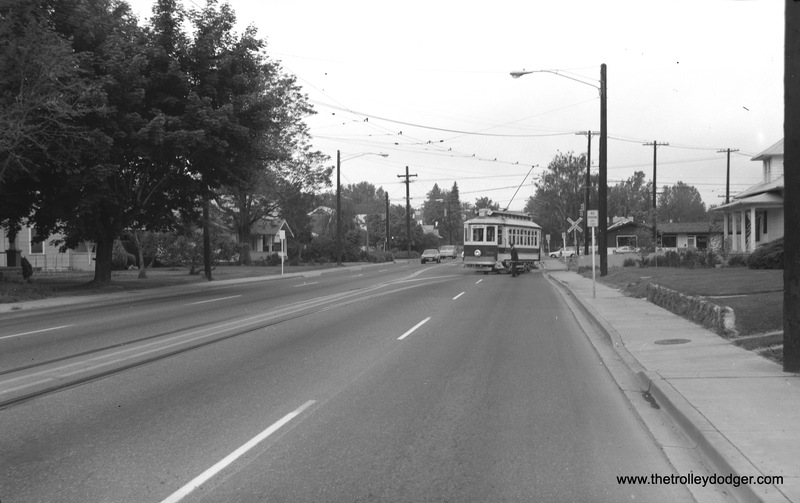 Buses do not have this problem, they just go around. 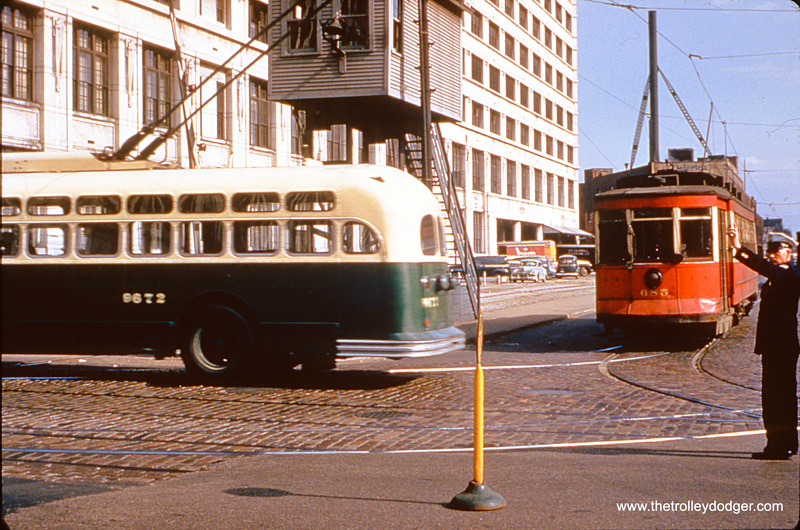 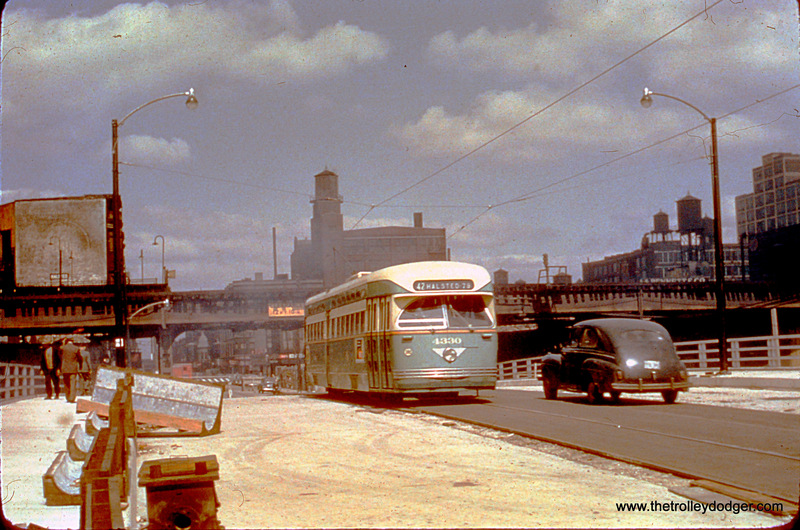 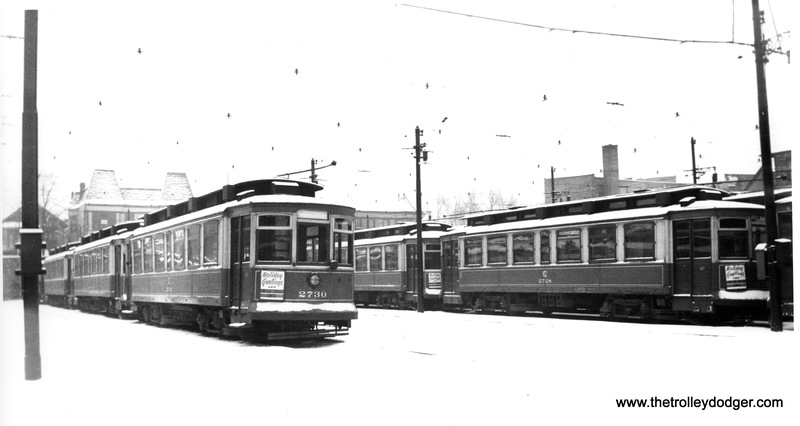 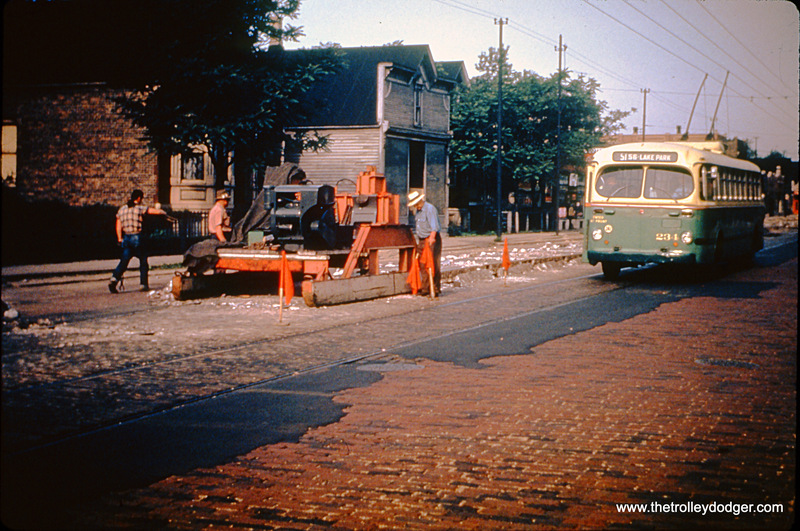 Pix #564 & 565 are SB Cottages returning from Grand & State on Wabash. 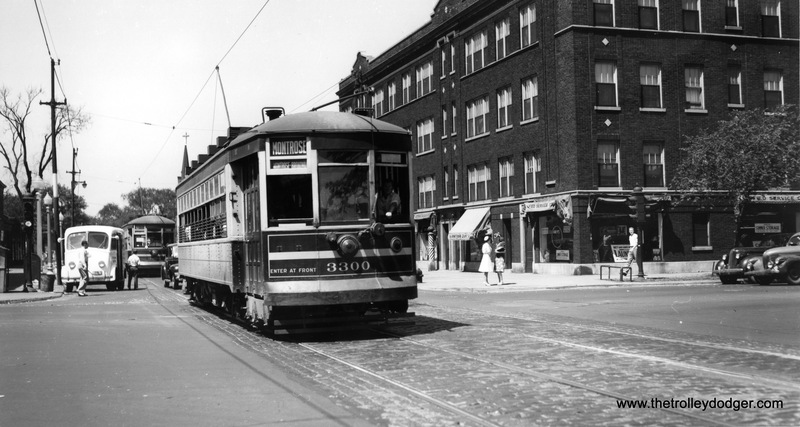 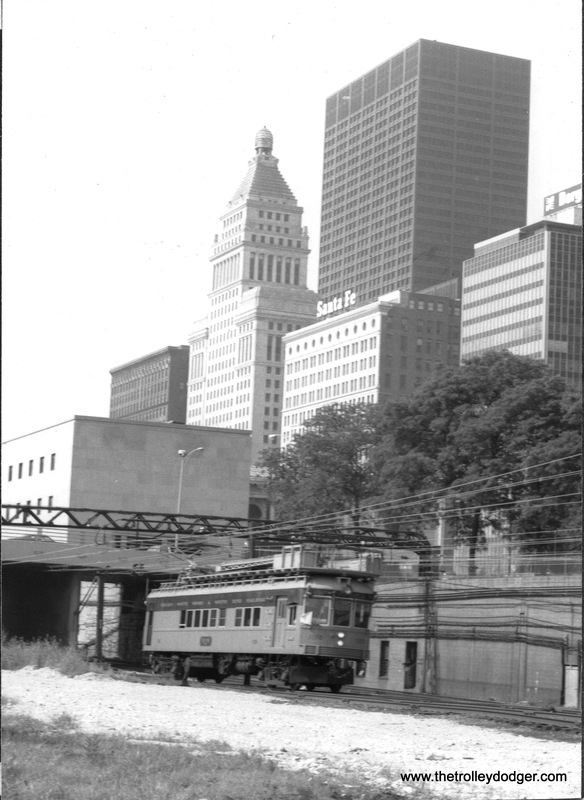 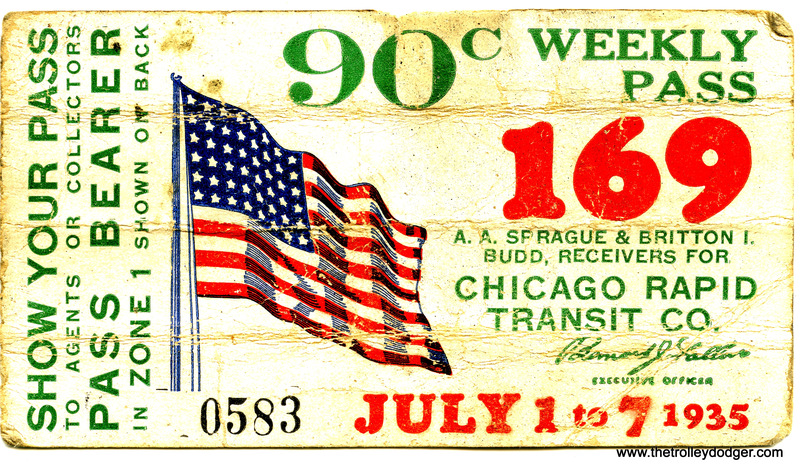 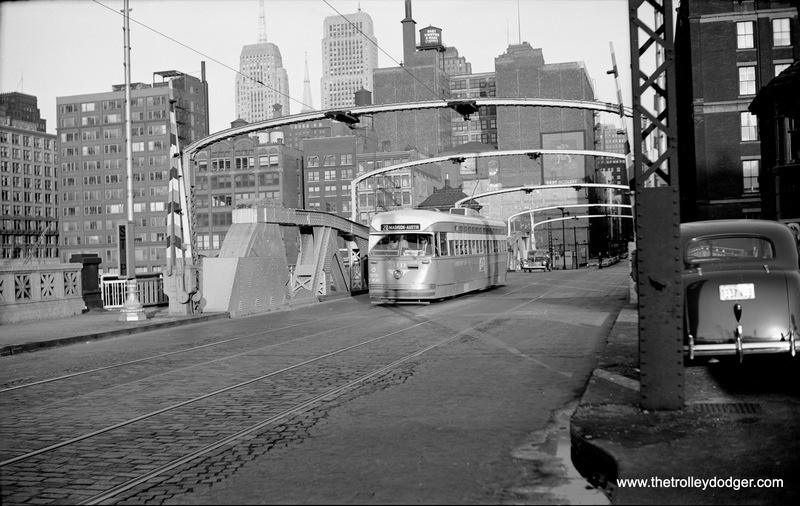 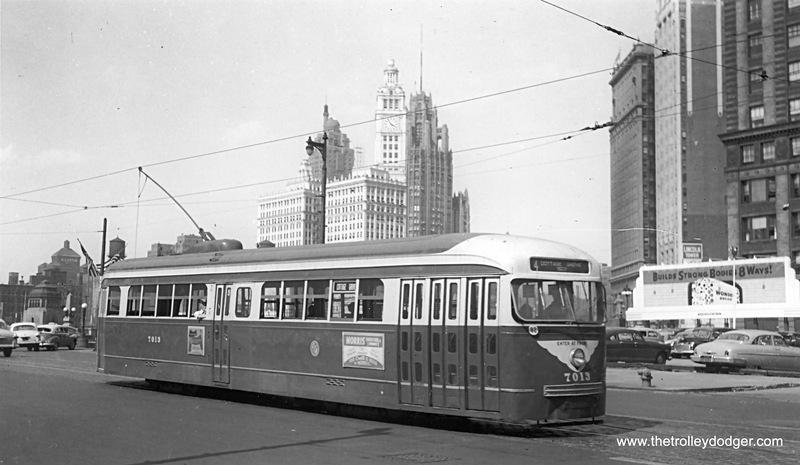 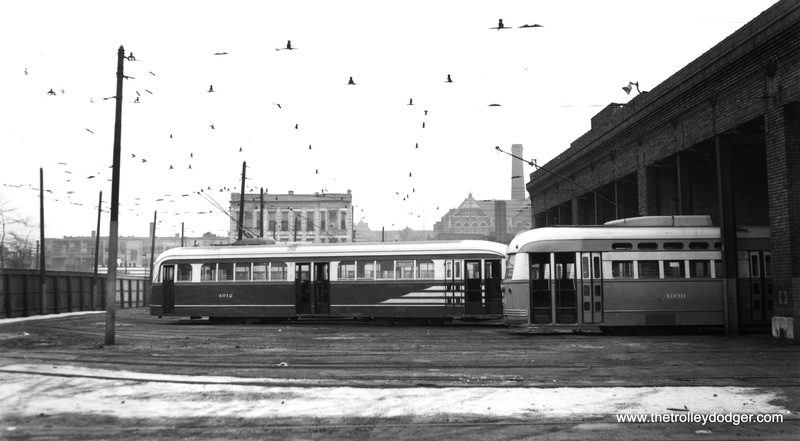 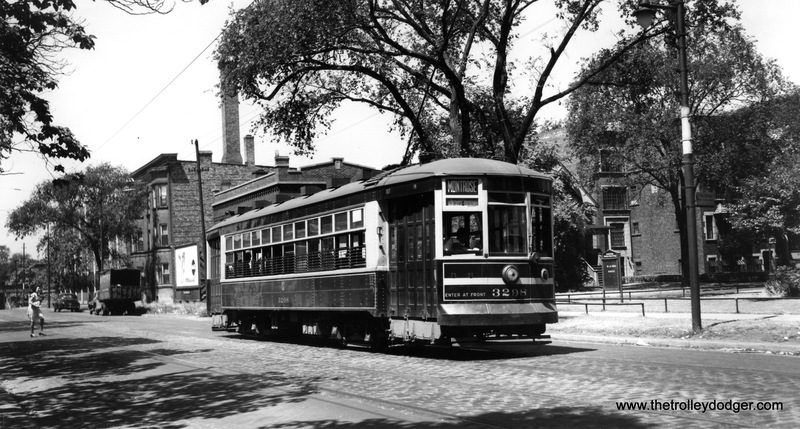 The #38 Indiana north term was Navy Pier via Wabash & Grand, when it ended as a route, the #4 Cottage took its place north to Grand on State & south on Wabash, for awhile. 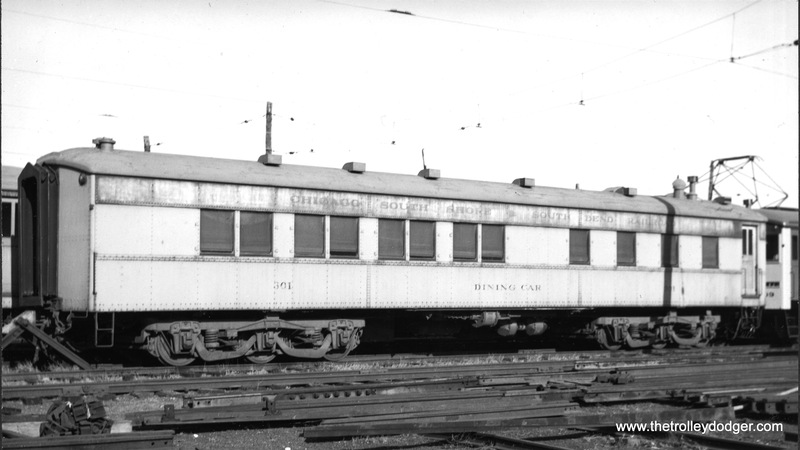 #582 Seems to be a Riverview-Larrabee car, could be Wrightwood car Barn. 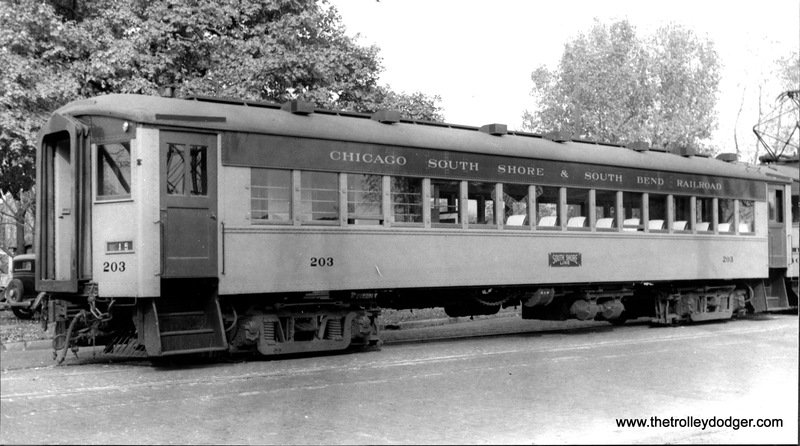 #599 I beg to differ, the car probably is a SB #8 Halsted-79th with an incorrect sign. 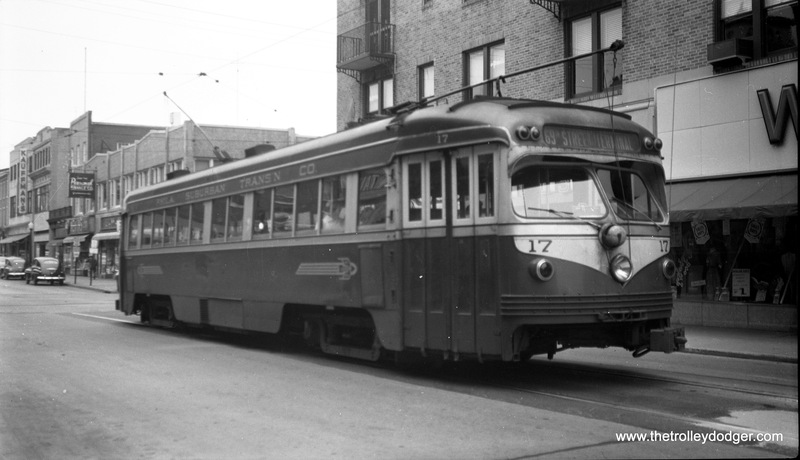 Still on the same route to 79th. 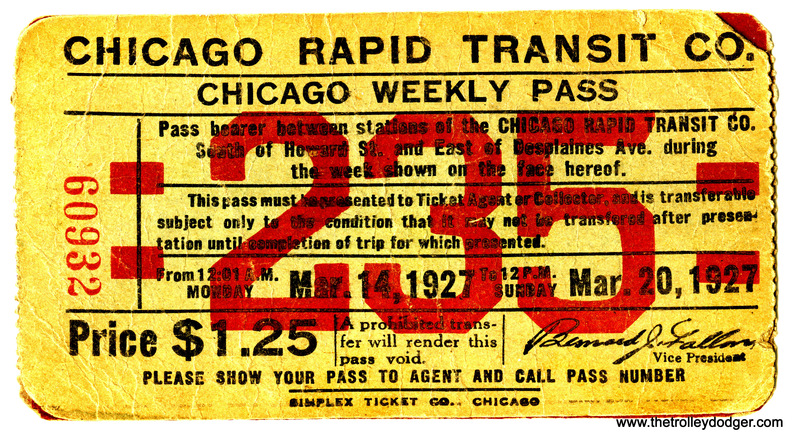 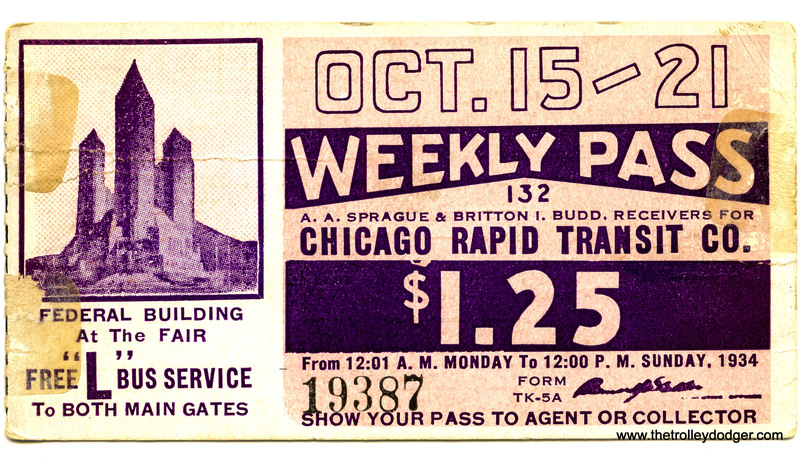 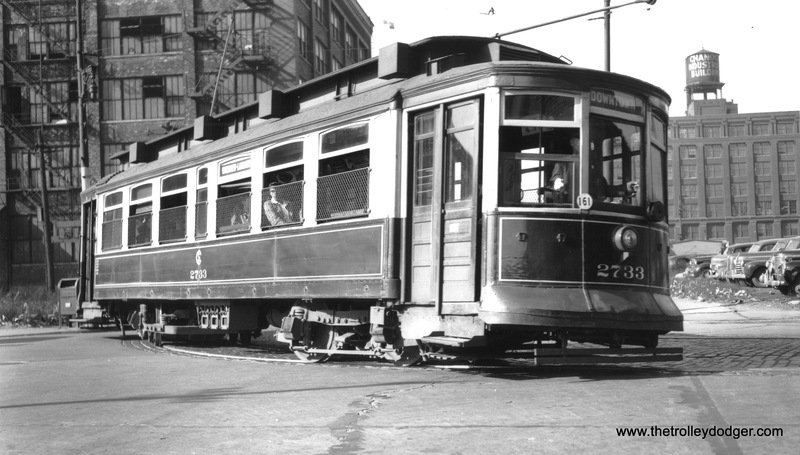 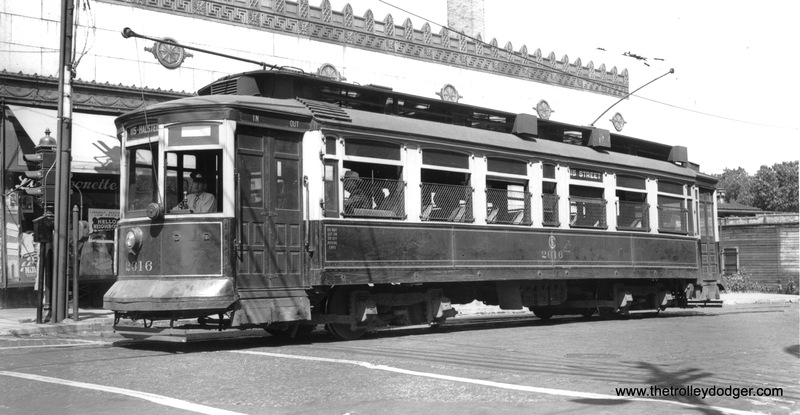 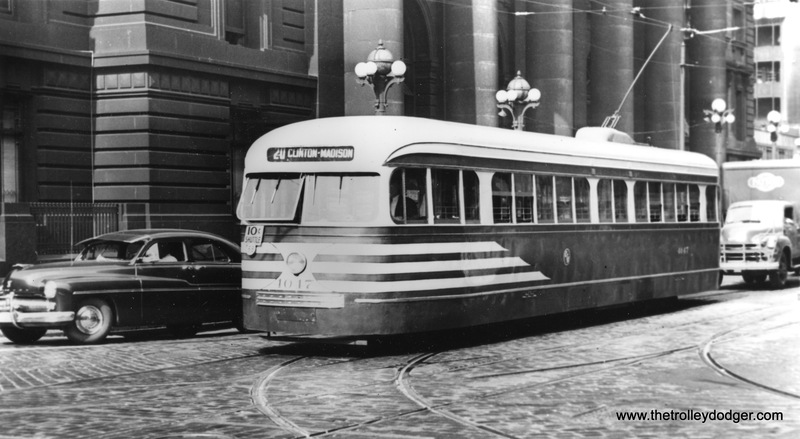 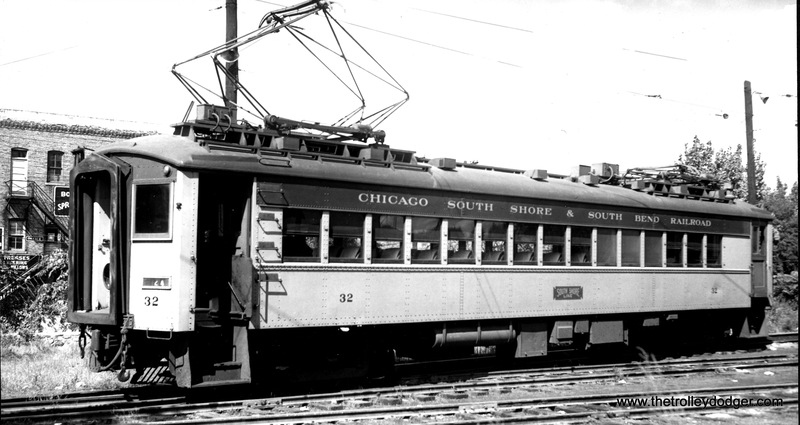 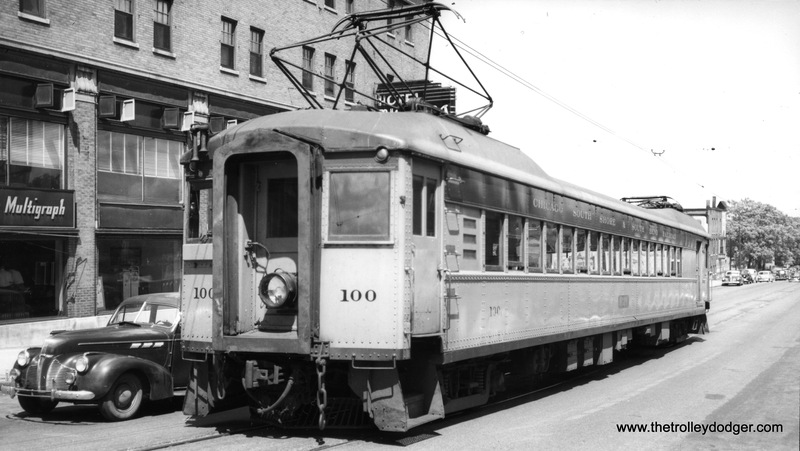 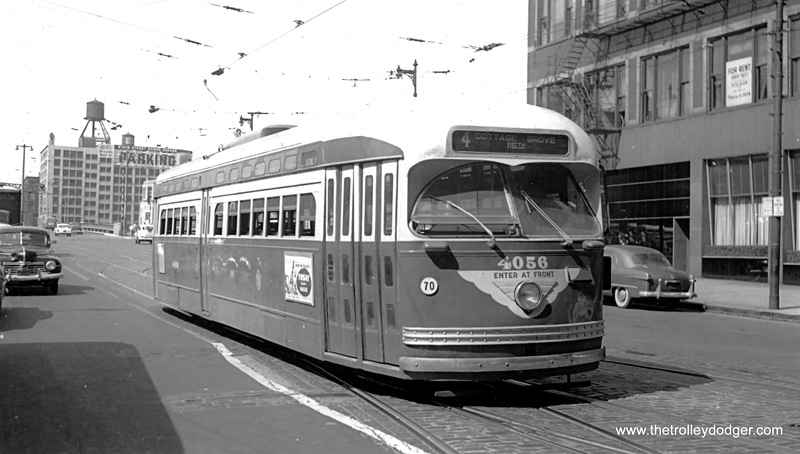 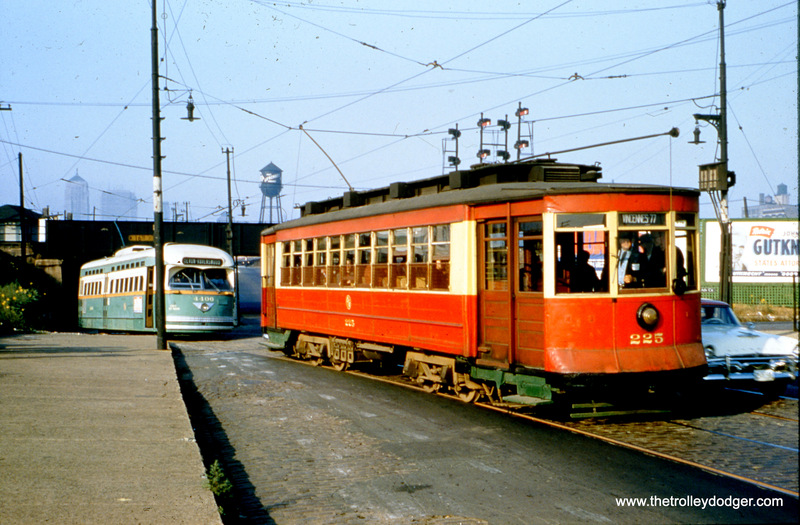 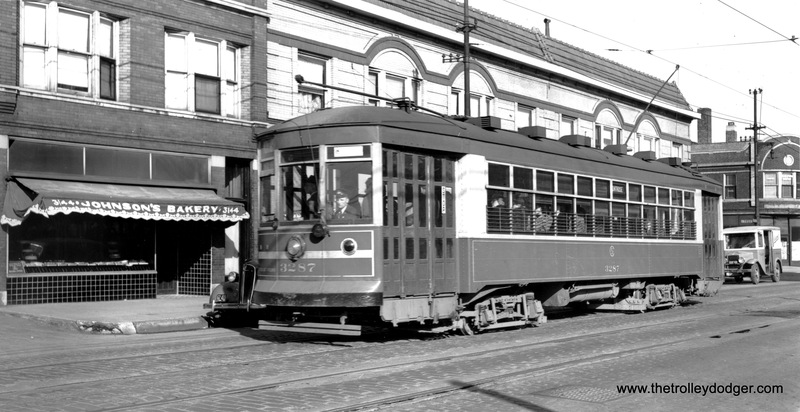 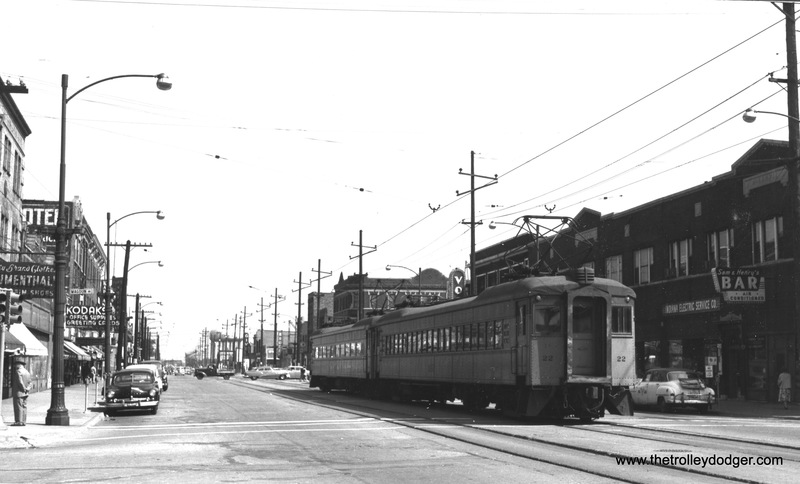 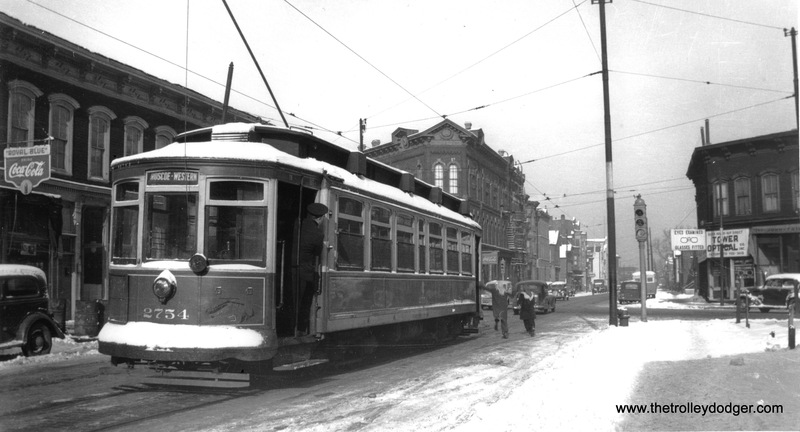 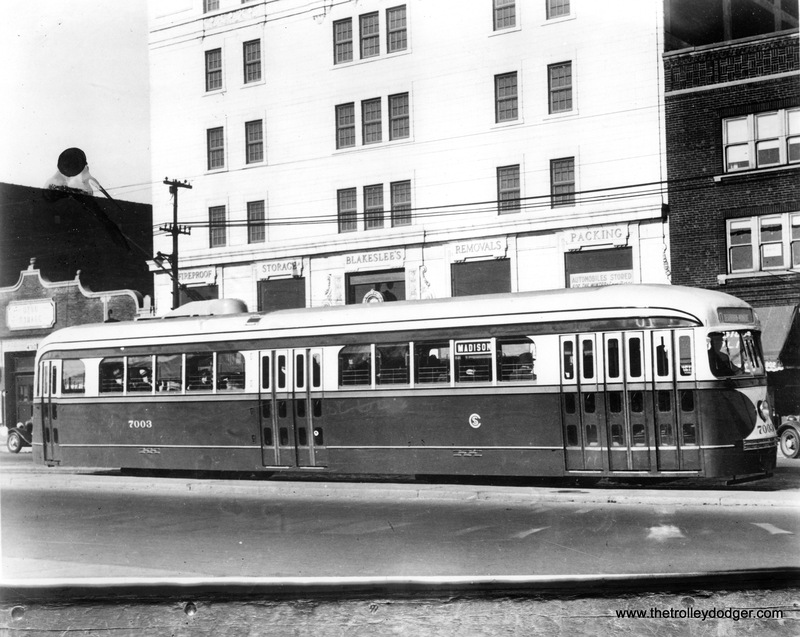 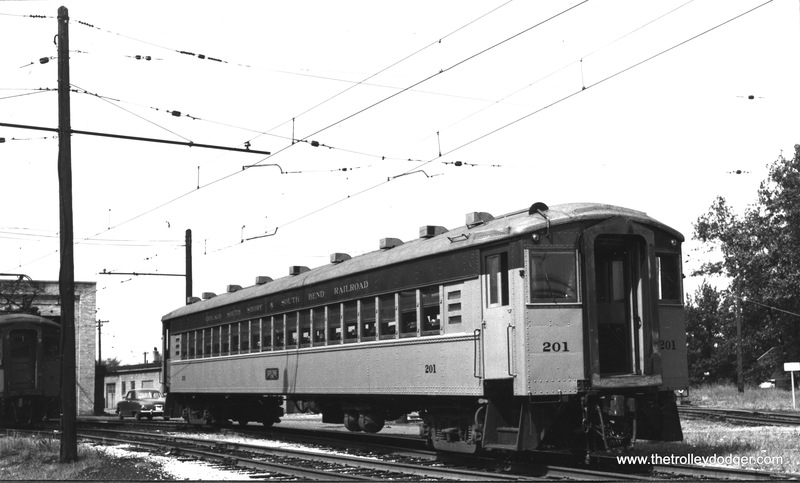 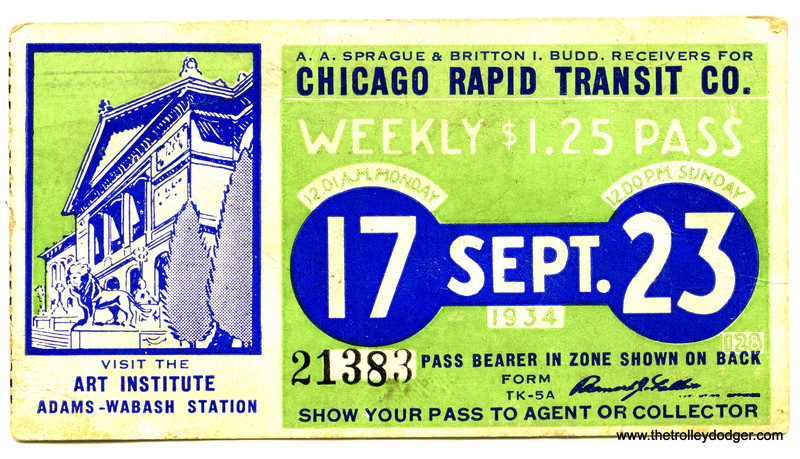 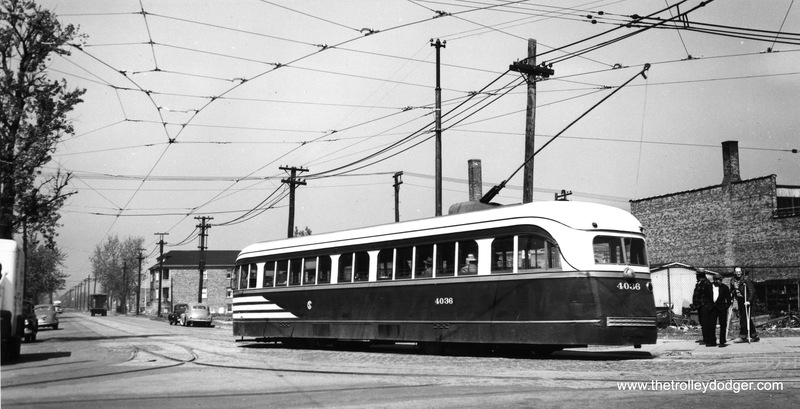 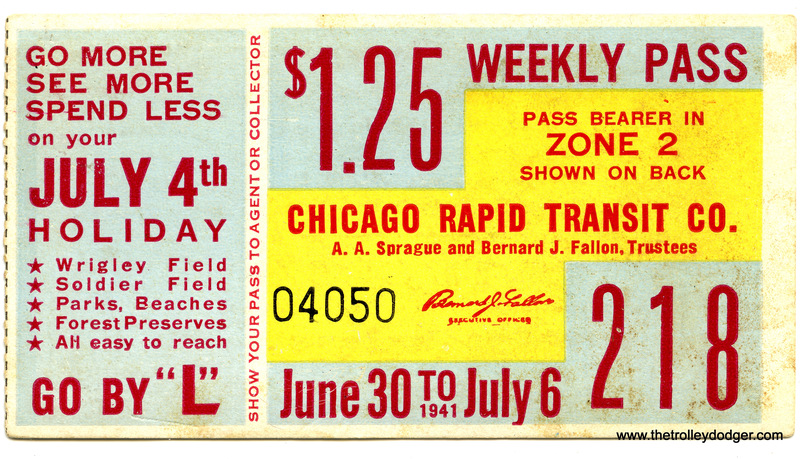 The #42 never ran on Halsted between Archer & Clark on the north side. 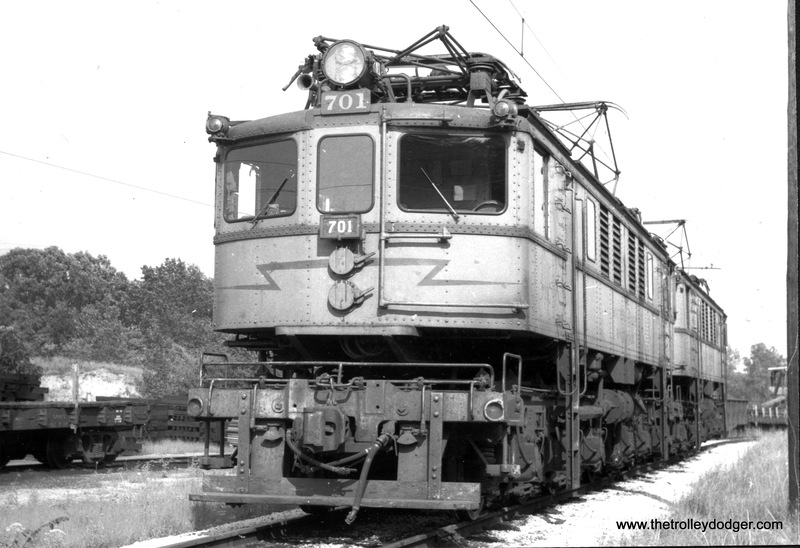 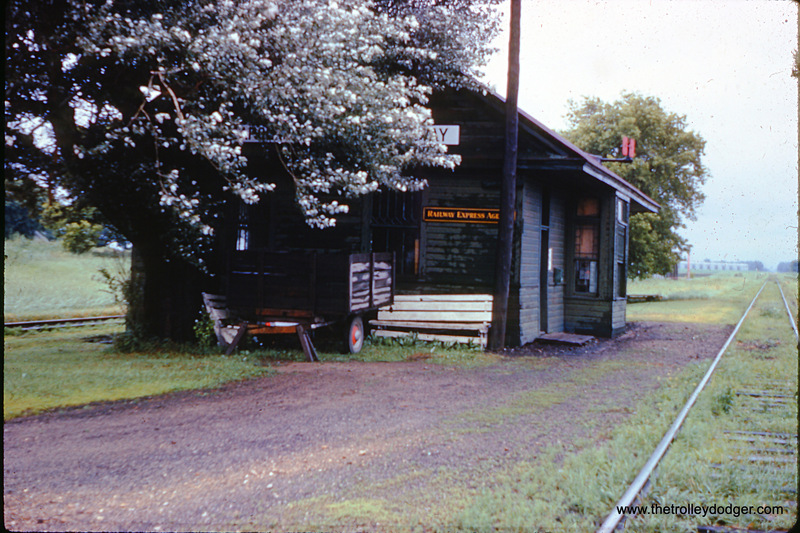 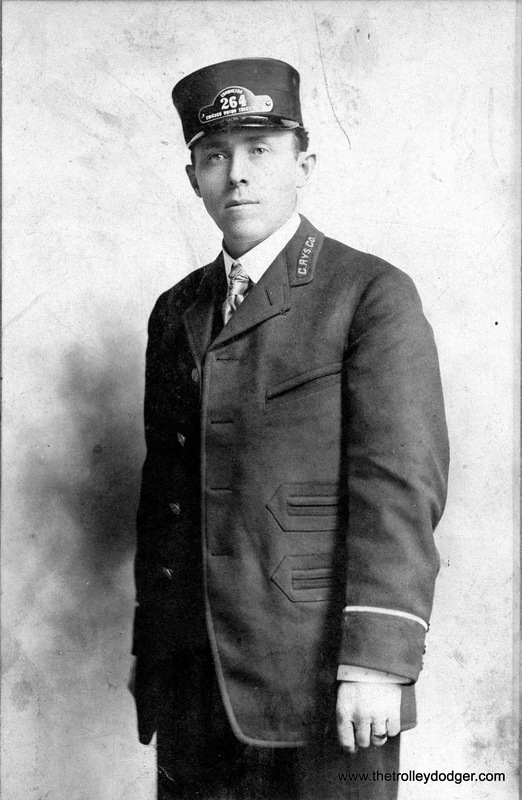 The motorman saw the 79th thru the little view window & stopped there. 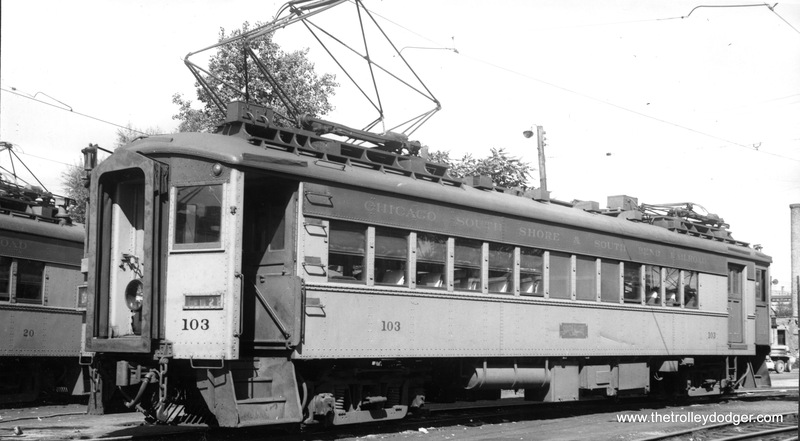 Photo 593 of car 5073 was taken looking west on 38th St between Kedzie and Pulaski. 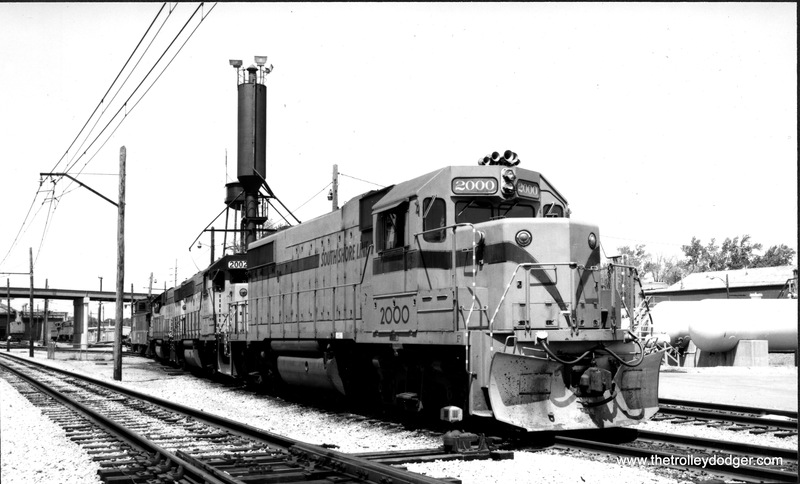 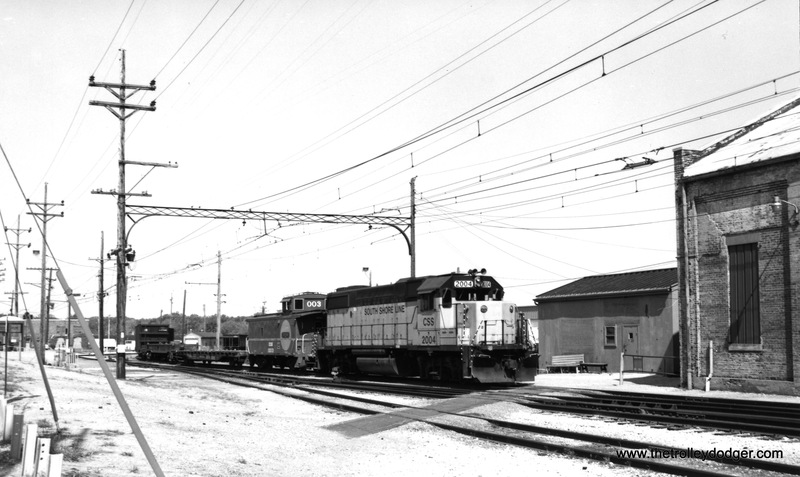 The tracks in the background are the Santa Fe and Illinois Northern coming out of Corwith Yard. 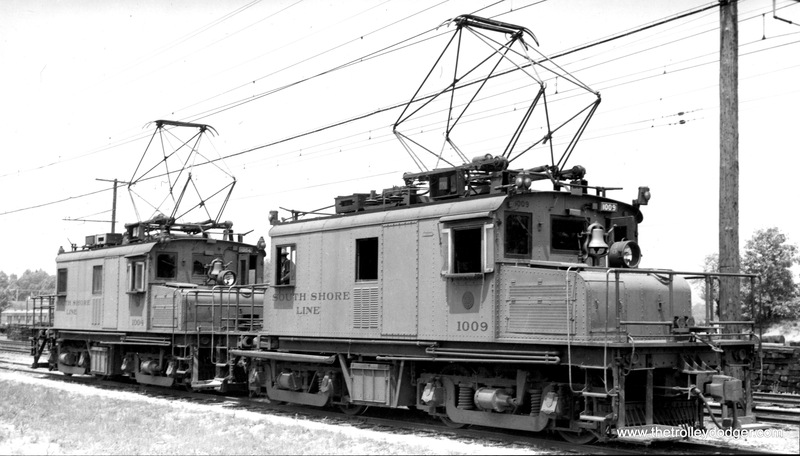 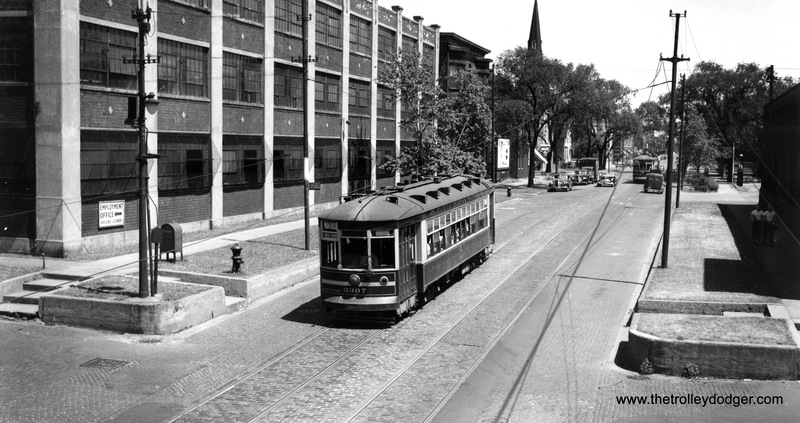 Commonwealth Edison’s Crawford Station is seen in the background.